The venue is located on the main avenue that connected minibus street to E-5 at Bostancı. It is more close to E-5. I have dropped by for a lunch before but I could not understand what I ate because of crowd. The venue that I visited again was half empty on a late Saturday afternoon. There were closed outside area and inner area near kitchen. I preferred to inner area to sit. Due to I was hungry, I ordered 1 ½ portion normal meatball immediately. They called it finger meatball. 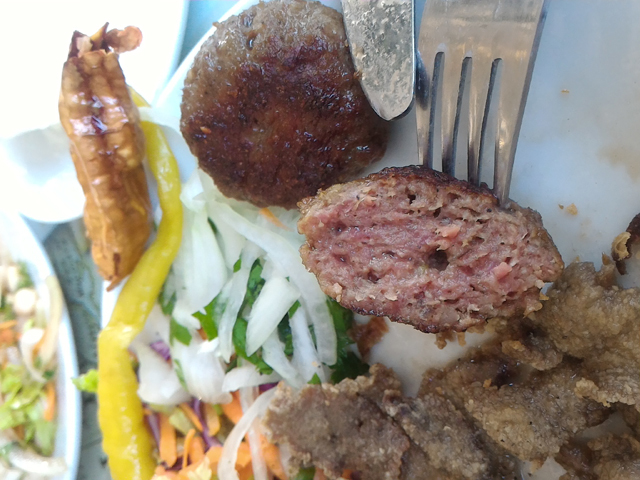 Its shape is smilar İnegöl style meatball but its texture is very loose. 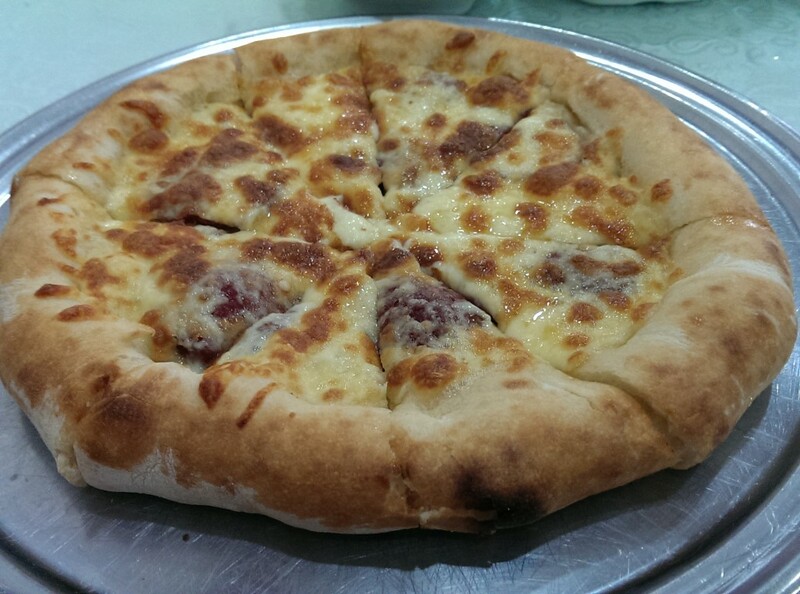 There is another version that is round shape and light hot like butcher meatball. The walls of the venue is full of black-white Ankara photos. 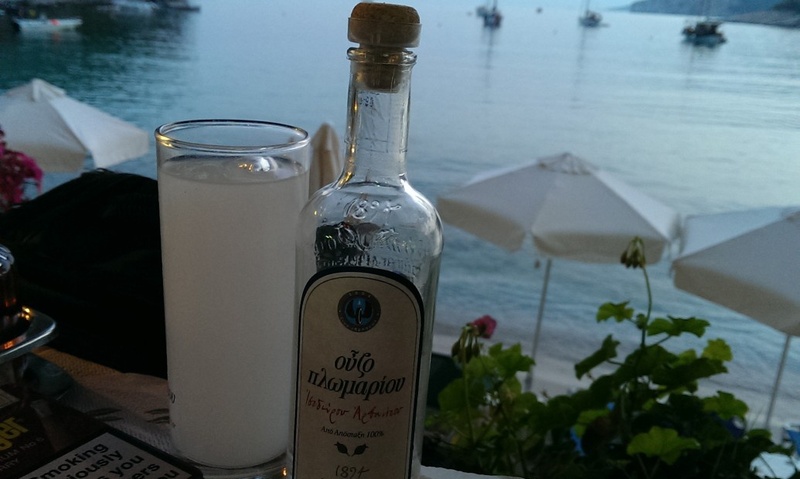 There is no open ayran in the menu as beverage but you can find Ankara soda water as a different option. It is a banana flavoured soda water but it did not appeal to me. Menu is so simple. Meatball, ample greenery kinds as siding, walnut and crispy pumpkin as dessert. 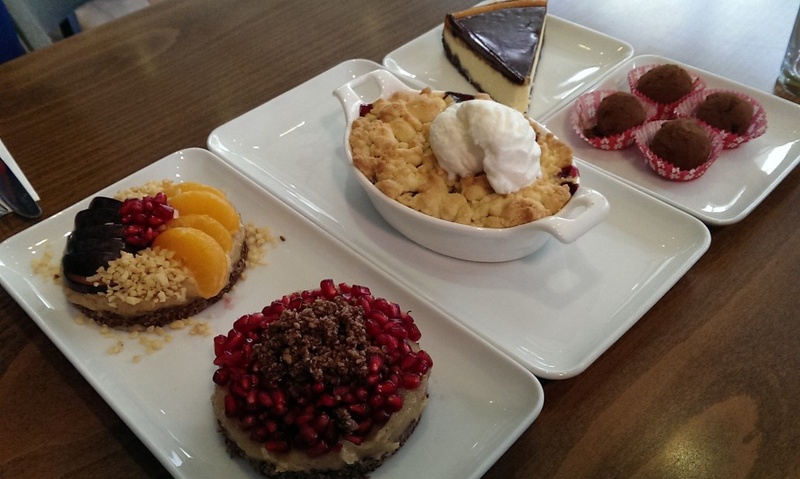 Everything is eating with hand, dessert is eating with toothpick. Even you want knife, fork or plate they are not. 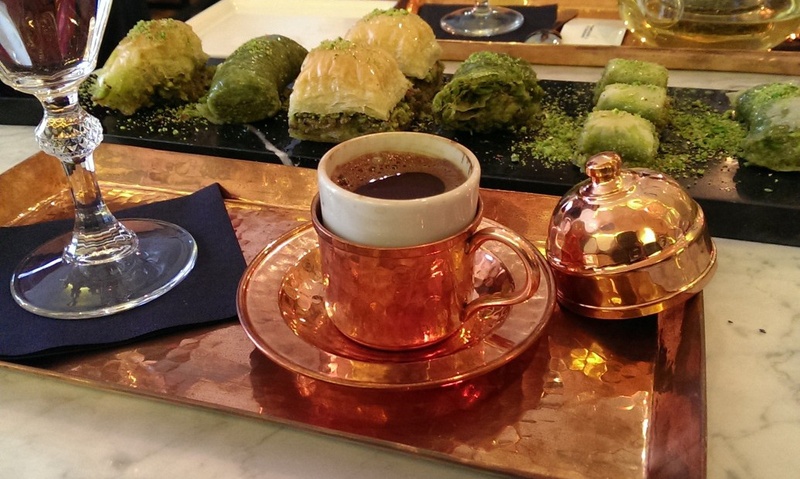 I had chit chat with its owner, Murat Bey at the fireside. He talked about he does not serve blarney to make genuine the venue and he preferred a concept and name reflecting his Ankara roots. 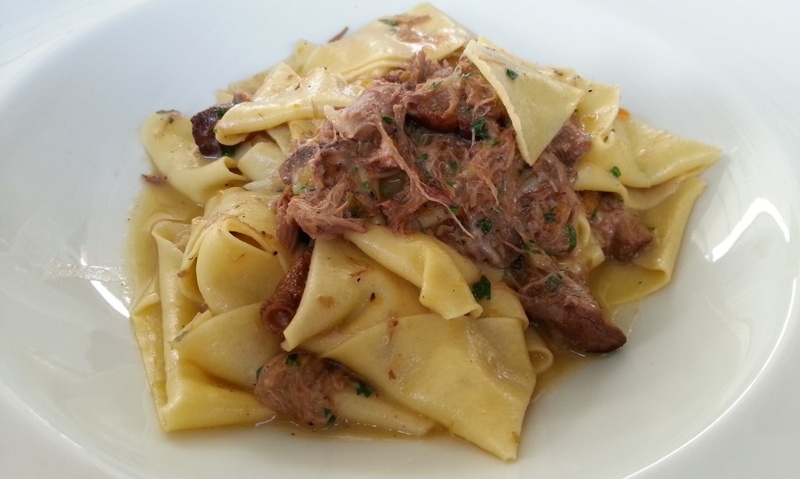 Meatballs is %100 veal and preparing with their formulas. There is also a little bread (%3-4) inside of it. After my order, they put a big paper as cloth then a transparent nylon. Waiters put the greeneries carrying in strainer to this nylon. They are chopping lightly with a chopper and squeeze lemon from top. 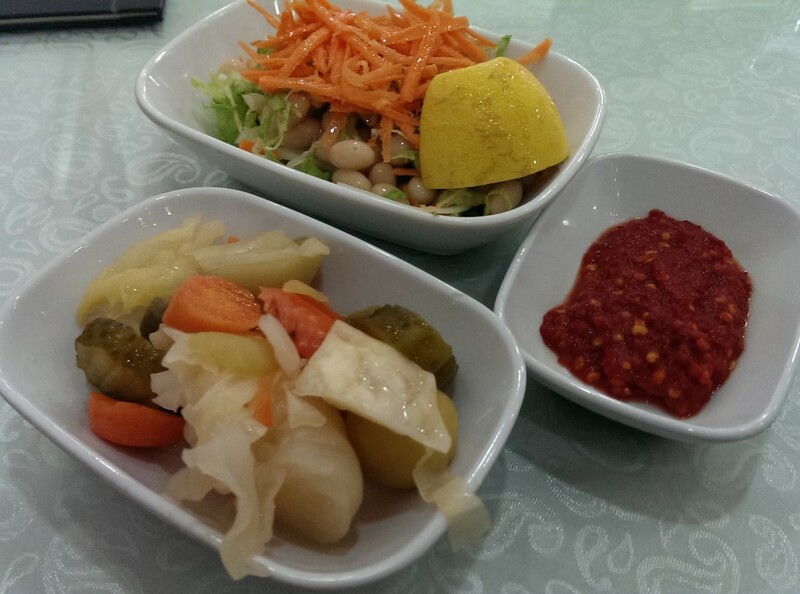 Vegetables are very fresh and ample. There are kinds like parsley, lettuce, radish, fresh onion, mint, cherry tomato, sorrel. 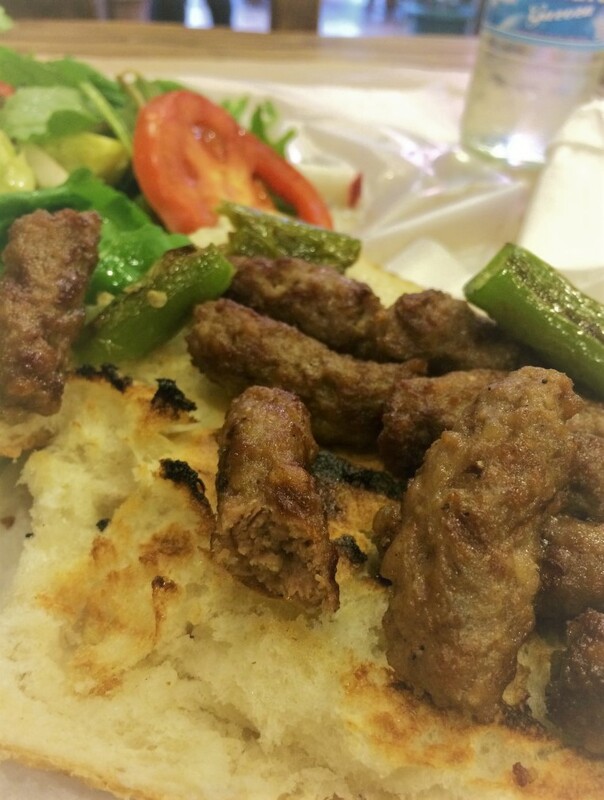 Meatballs are serving on a lihgtly fried half bread on coal fire. It is also given a piece of grilled tomato and pepper. I said to Murat Bey My meatballs were too dry than I expected. He talked about they maket he brassing according to the customer preference. 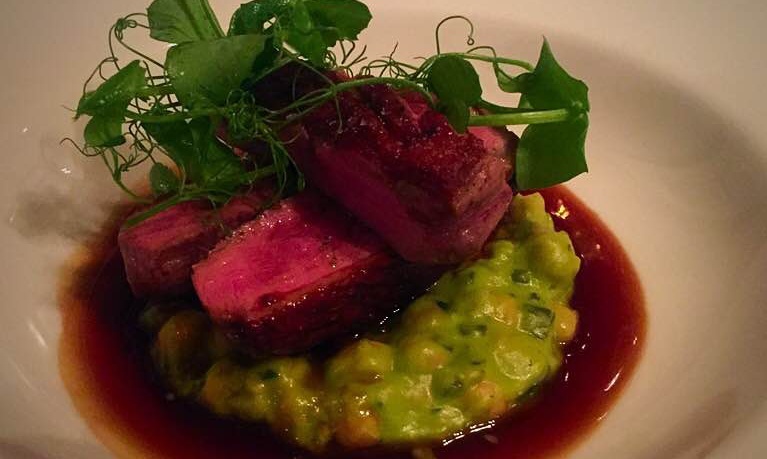 So, if you like rare cooked do not forget to state before. The venue is concentrated only meatball. Other grill kinds like soujouk, chicken are not especially in the menu. Murat Bey is a smiling artisan. He offered crispy pumpkin dessert and tea after meal. The customer potential of the venue was much again. 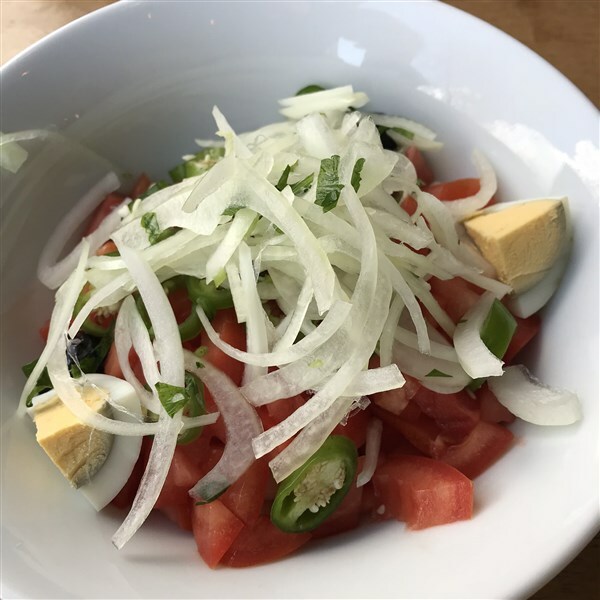 The only point to criticize is te absence of a written menu. By the way they will moved to their new position on the same street in 2018. 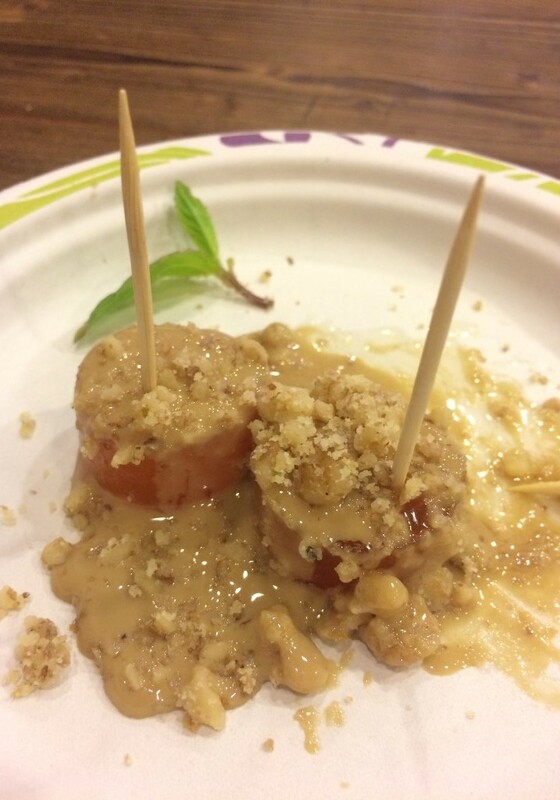 Taste: The venue has a unique meatball recipe. 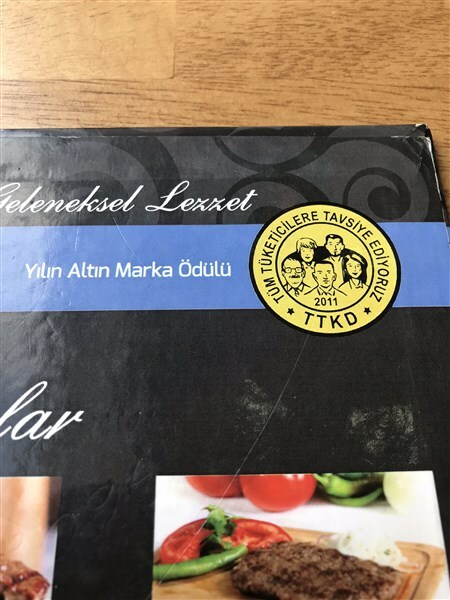 It does not like classic meatball kinds like Tekirdağ, İnegöl. The taste of the meat is nice. There is no dominant of spice. I can not say it is a unique meatball but it is eating with joy. It is a nice detail that garlic is cooking in folio instead of adding into meatball. To sum up they became successful in respect of creating a different taste. 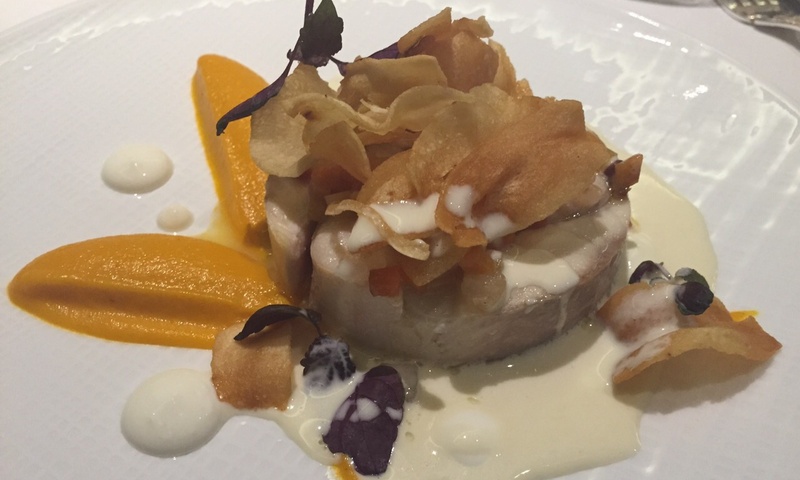 The crispy pumpkin dessert I tasted was also nice. Braising: Meatballs are cooking fast due to they have a loose pattern. They did not burnt but it should be cooked less for me. 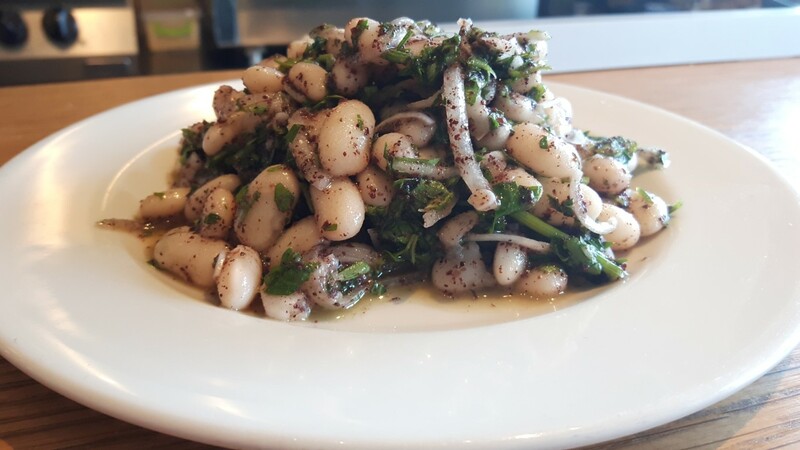 Portion Size: The125 grams portion might be increase to 150 grams. Because there is no siding support except greenery and bread. Finger meatball is consisting ten pieces in one portion. Hygiene: the venue is booth but I have not realized any inconvenience. They are giving small, press&pull wet wipes. Service: It was obvious that the waiters are used to make service to crowds. They have a dynamic staff. After my order the greenery is on my table in a few minutes. Then, meatballs came at once. It was an artisanal manner to be offered tea and dessert..
Price: The cost of portion meatball is 21₺. 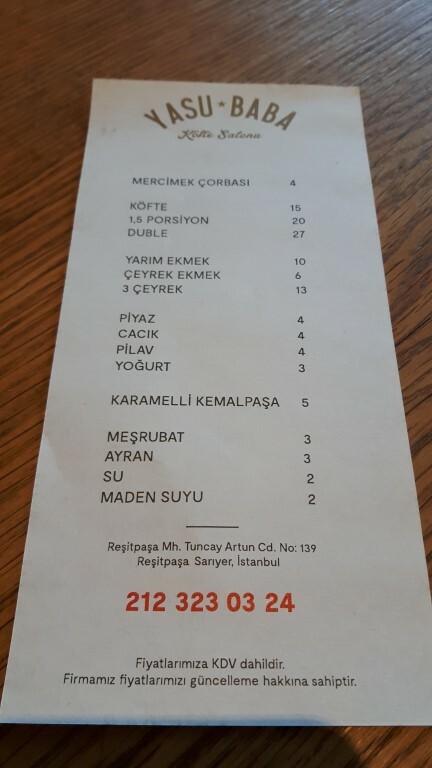 I paid 31,5₺ for 1 ½ portion. They should decrease it a bit down. For instance 28-30₺. It will be an incentive to eat more. 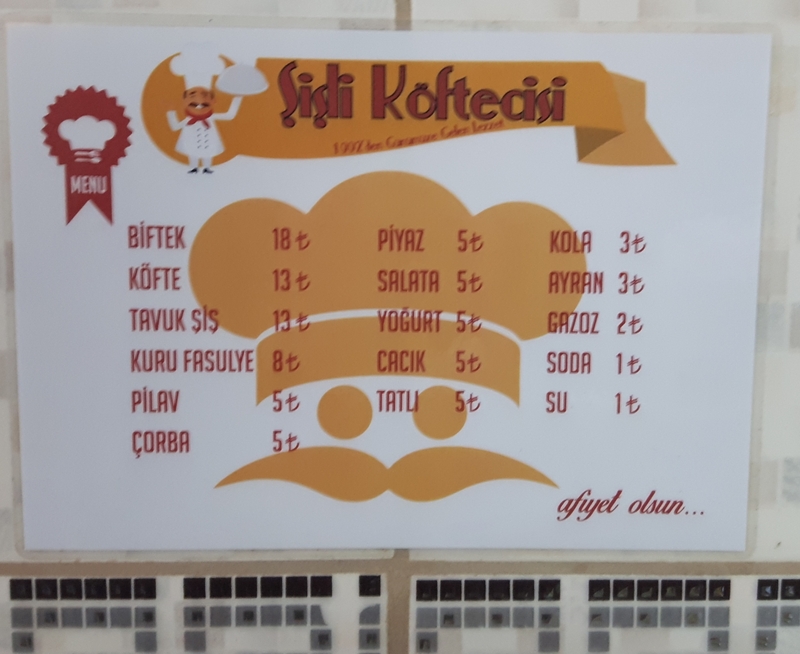 Deseert prices is 10₺. Beverages 3-4₺. 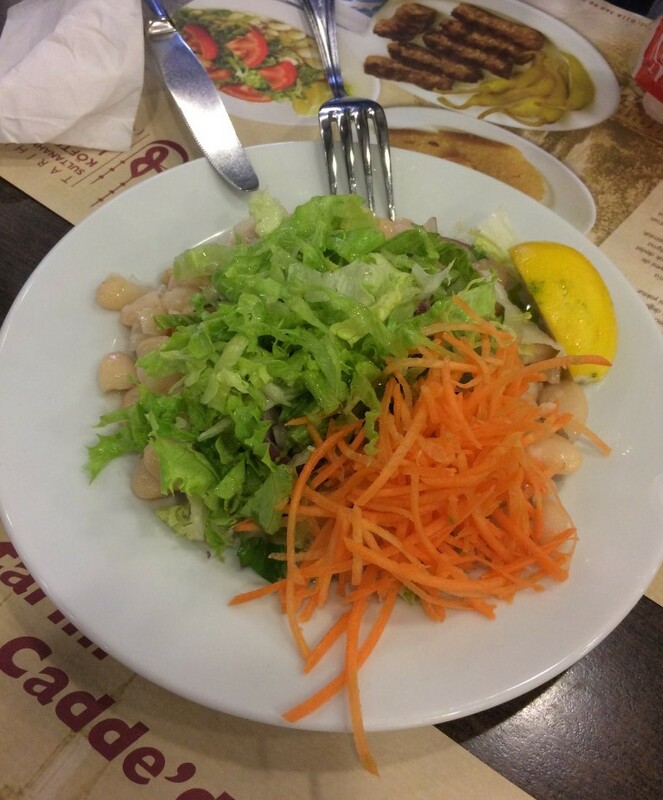 If you are hungry, you order directly 1 ½ portion directly. The price is expensive for some of us due to the little siding. On the other side fresh greenery is an original siding. 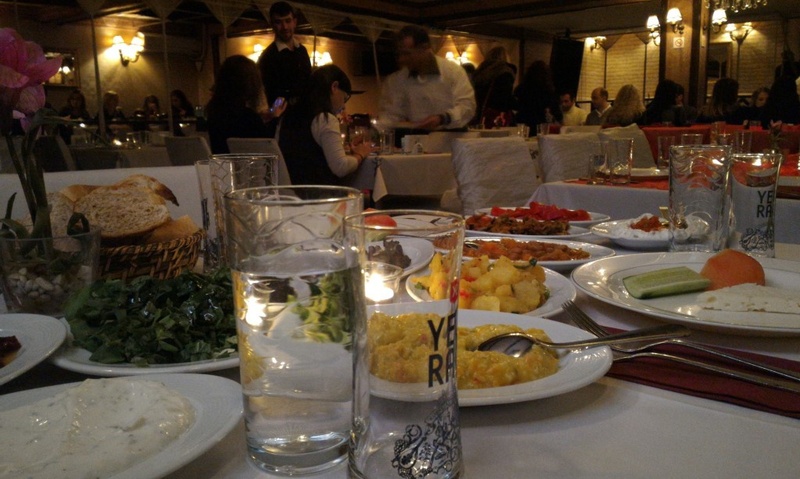 #KanGurular Erşen T.
Temel Reis is a venue that located on the road through Bağlarbaşı to Üsküdar. Though we passed several times in front of it; it has not paid our attention till now. Thanks to the our work on “ the best meatball restaurant” we managed to catch this kind of wonderful venues. 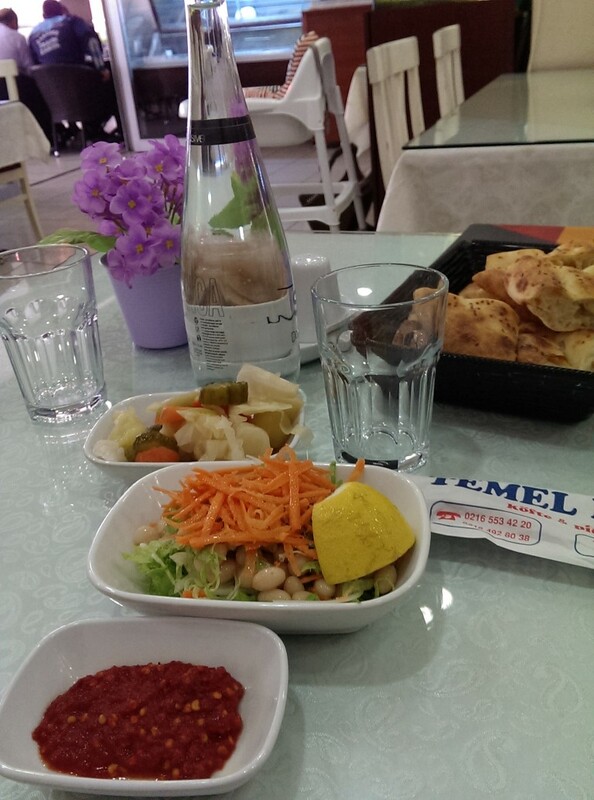 Temel Reis is a family businnes established by Ali Kemal Kasap in February 2000. 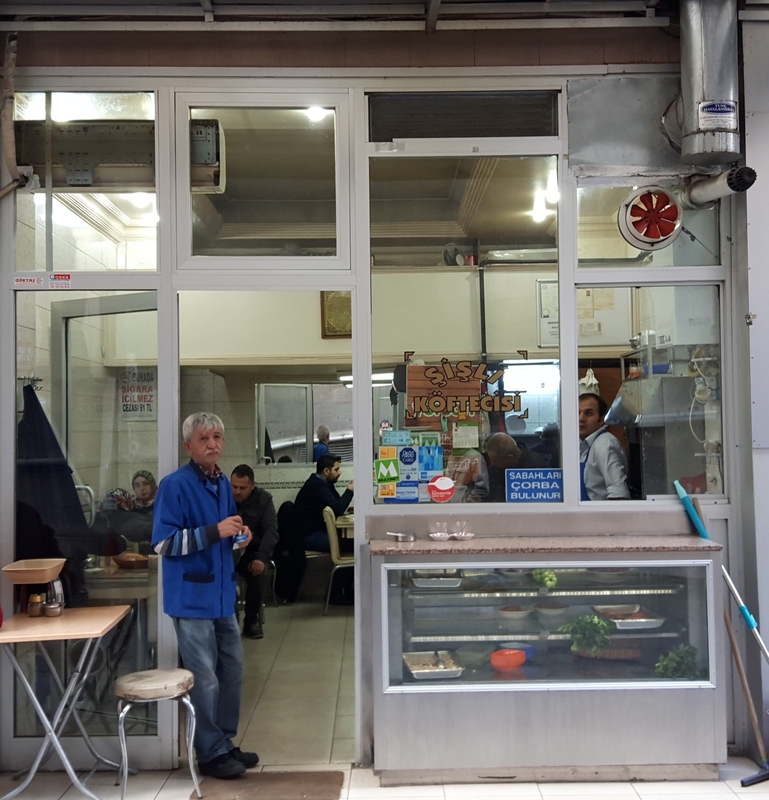 Ali Kemal Bey has managed to expand the business without sacrificing quality and created a regular customer profile with his two sons. 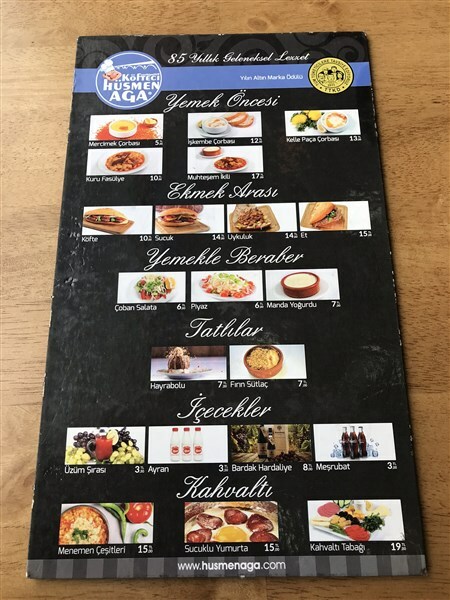 They have limited the menu with Akçaabat style meatball and Black Sea style flat pastry. 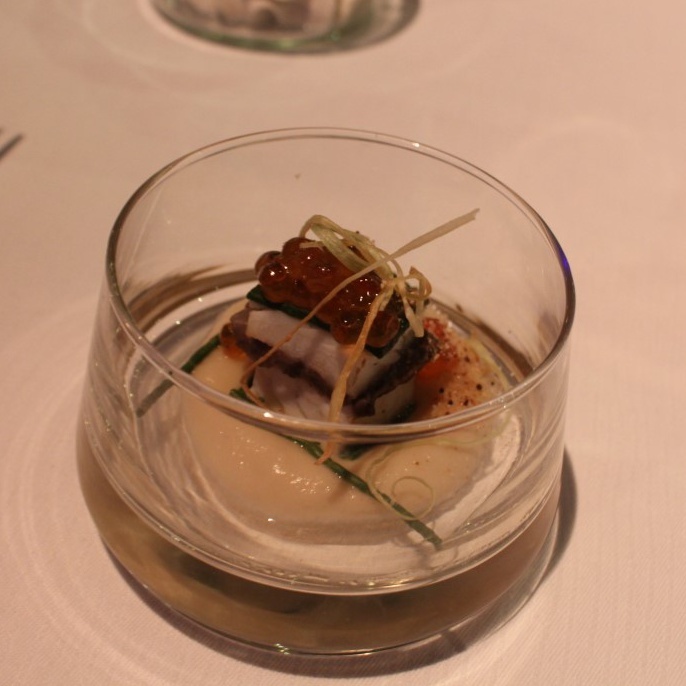 We love these kinds of venues which serve only the plates made nicely. If it does not prepare with mastership Akçaabat meatball might be a very annoying meatball. 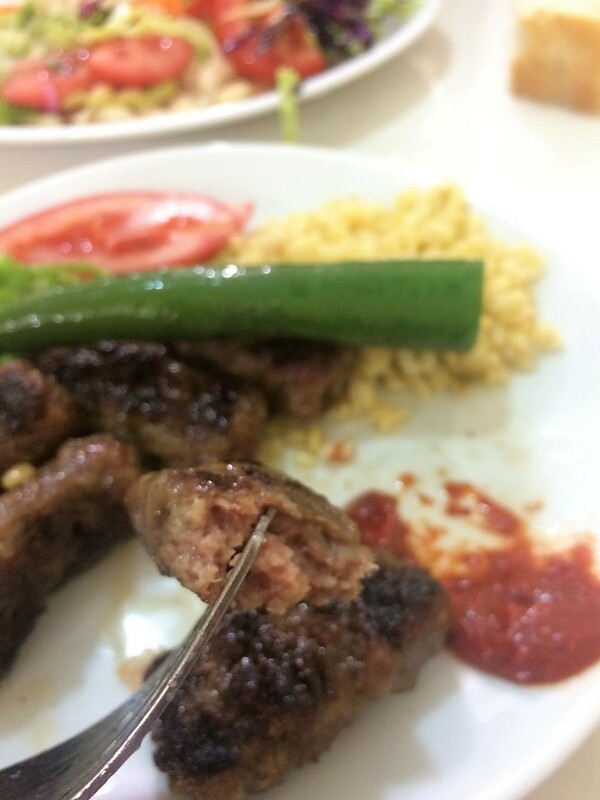 We experienced this situation on last year in Akçaabat in a well known meatball restaurant. It was a real dissappointment. 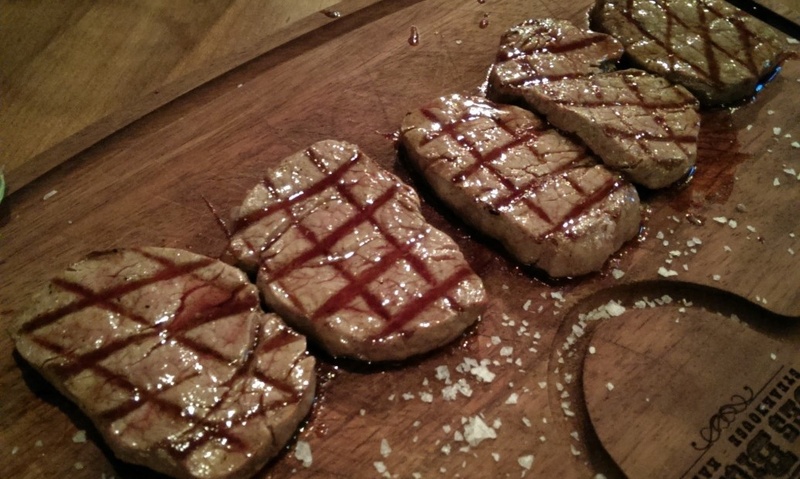 If the meat was not good and produced as mass production it is understood easily. The taste was awesome. %100 veal is used in the meatball. 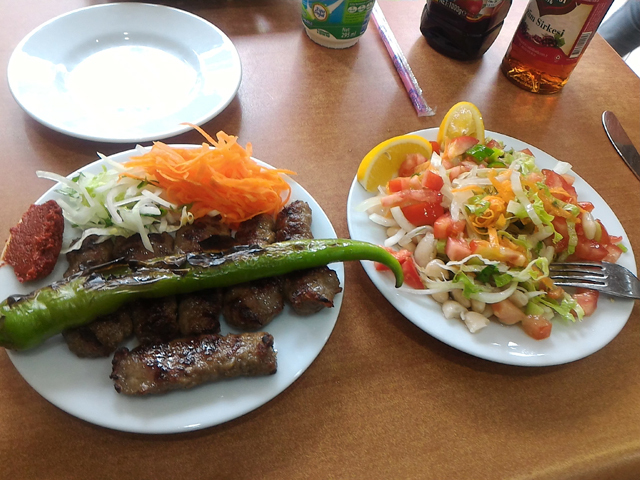 They provide the meat from afyon and Balıkesir choosing by tehmselves. 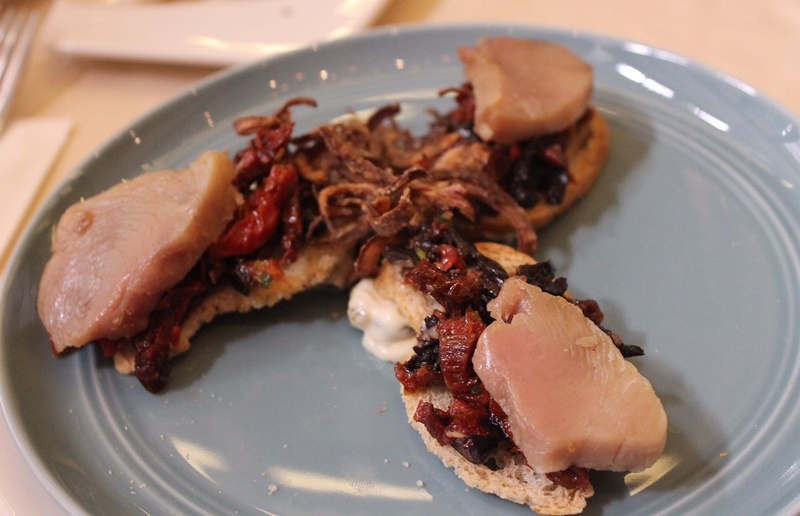 The three parts of the veal ares uesd in the mixture. One of them is neck. The other ones are depends on your imagination. Because it is a secret. 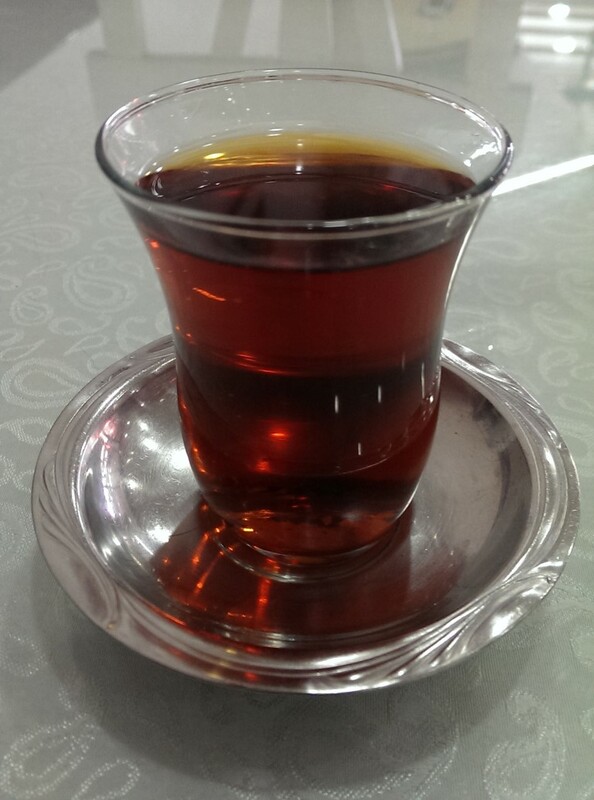 They ae also adding “ kavram yağı” to the mixture. They provide the oilness of meatball with the balance of the mixture. Additionally, it consists bread, garlic and salt. They are never use spice. If there is no spice you have to use good qualified meat. 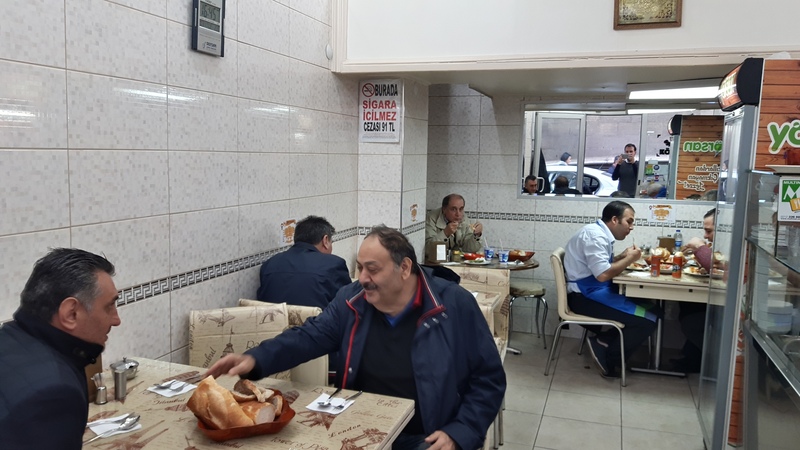 İt is hard to cover the taste due to there is no spice. So, you have to use qualified meat. 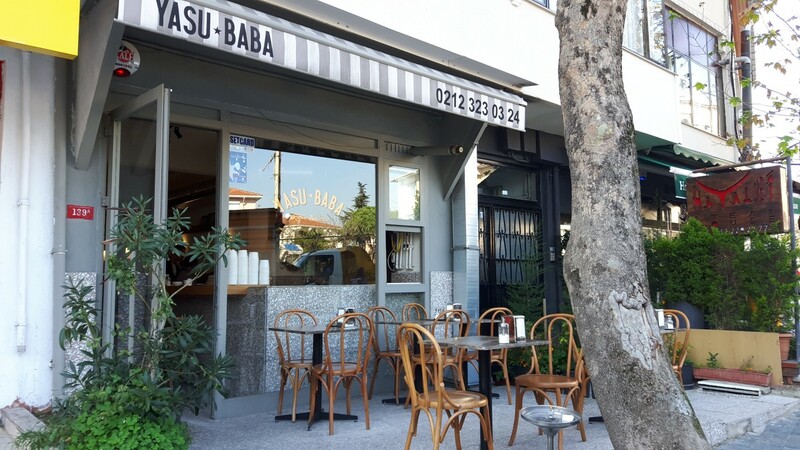 The owners and the master of the venue are from Akçaabat. 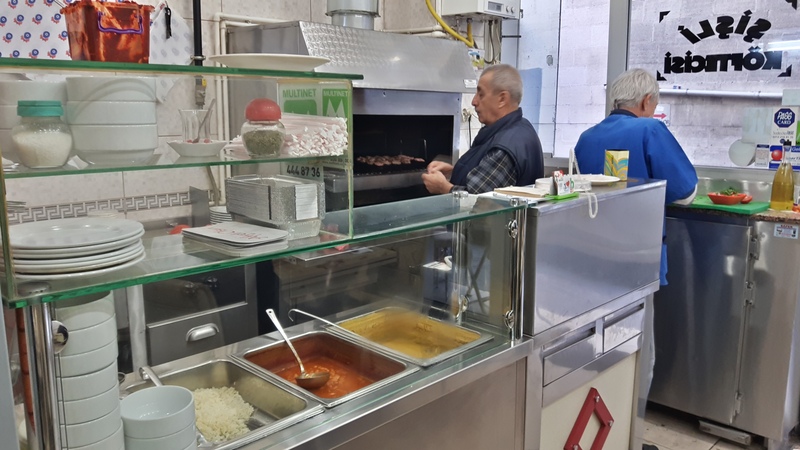 They had the meatball grill made in Akçaabat where is masters on this job. They are using oak coal. The coal is providing from the mine that they rented in Şile. So, all the conditions are ready for serving a nice meatball. 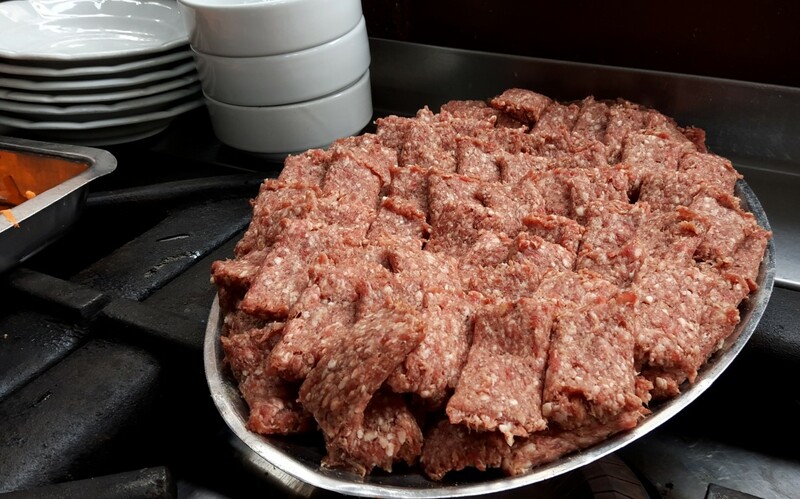 Meatball sidings: Blarney is made of İspir bean and was done to a turn. 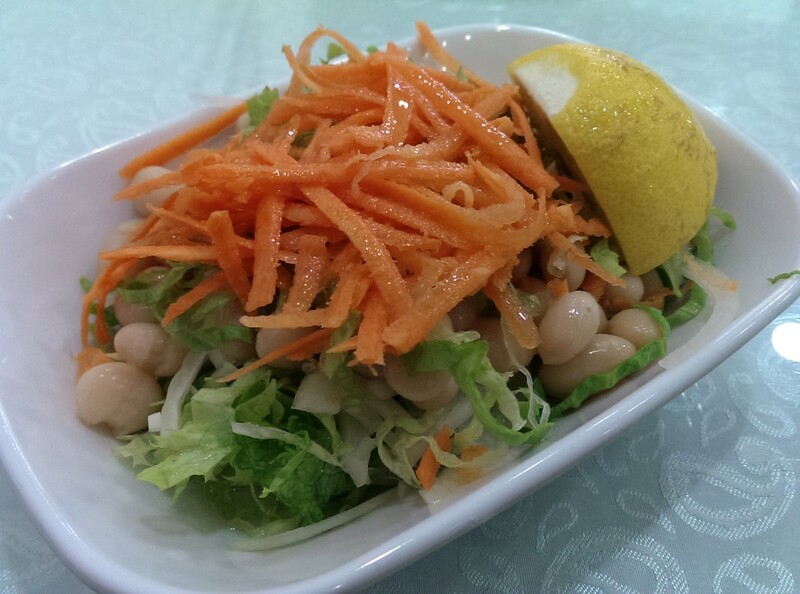 It has also consisted grated carrot and lettuce but do not to forget to say prepare with olive oil not sun flower oil when you order it. Blarney was perfect. You can visit the venur only to eat it. 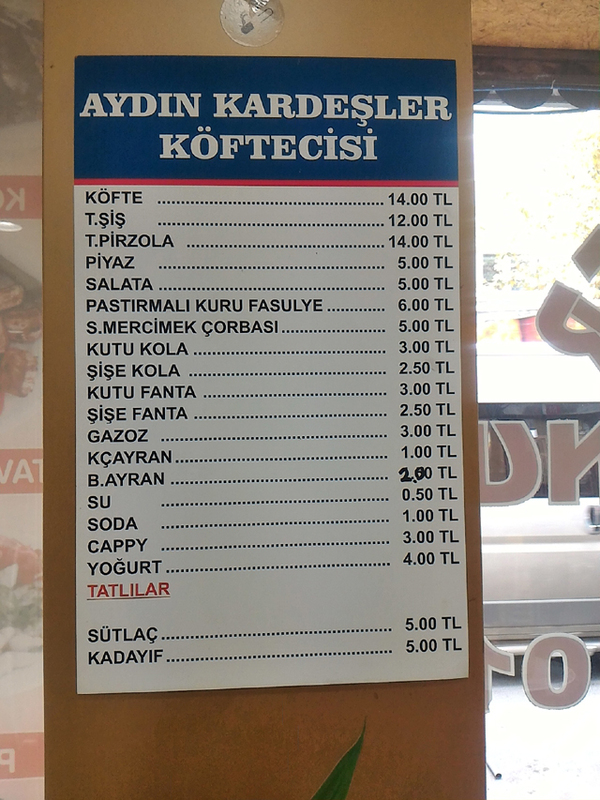 Ayran: It was made from whole yoghurt of Ateşoğlu. It is machinery butter milk with foam. The cream did not escape to the foam due to they had work the machine at right degree. 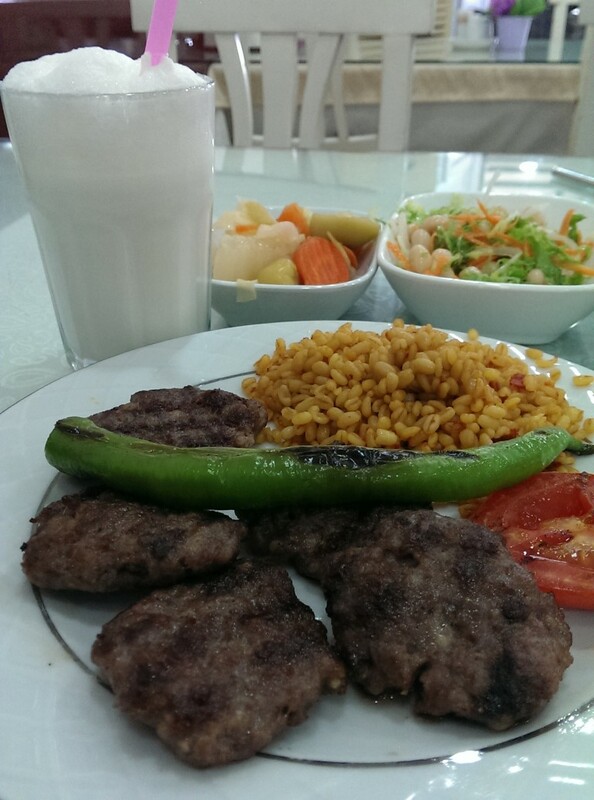 We drank a yummy ayran. 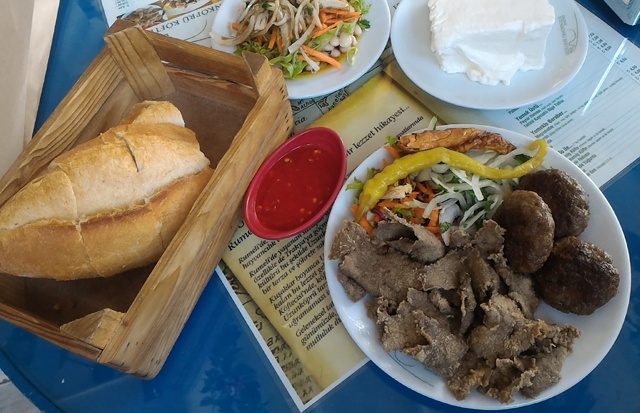 Butter and cheese are coming from Vakfıkebir. 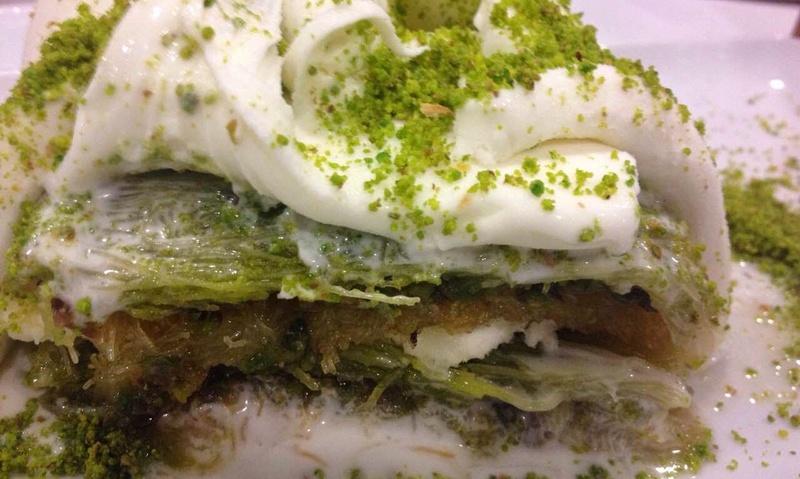 Baklava is coming from Akçaabat, rice pudding is from Hamsiköy. We preferred baked rice pudding as dessert. The taste was awesome. We have not eaten such a nice dessert for a long time. The venue is open 09:00-22.00 for weekdays 08.00-23.00 for weekend. Credit card is available. There is no take away service. They send the wide orders with vehicle. 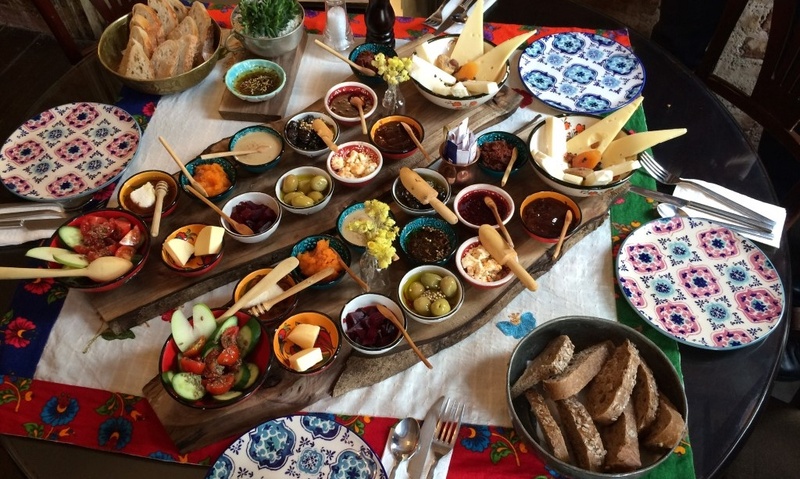 They are serving a wonderful Black Sea Region breakfast on Sundays. Mixed berakfast price for two with unlimited tea is 55₺. 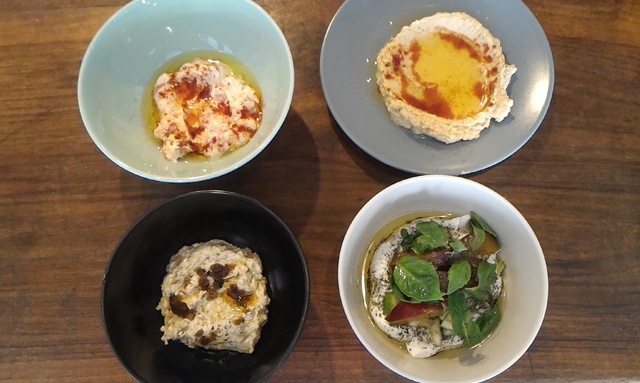 It also consisting eggs scrambled with tomatoes and green pepper, muhlama, eggs with soujouk. We want to try it on a Sunday. Consequently, their son, Serhat Bey, owners are in the production and operation process. 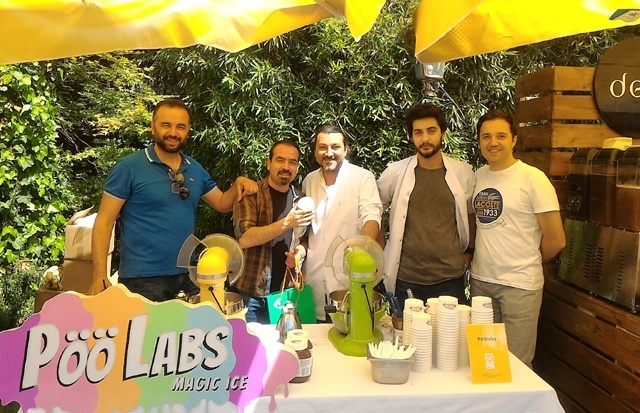 They are using qualified ingredients in a honest way and they are making a great effort. We liked the venue. #KanGurular Gültekin U. Taste: The taste of the meatball is wonderful. Blarney should be tasted also. Open butter milk is yummy. Rice pudding is awesome. Braising : The master have cooked the meatballs done to a turn. If you want, you want less cooked from him. Portion Size: the portion is 200 grams and enough. If you eat also blarney, you can satisfy easily. Hygiene: It is a clean venue. Service : Though it was busy; meatballs were served with a not bad pace. Usually, the service is focused on outside part. If you are sit inside area; you might be wave your hands for service. Price: Portion meatball is 20₺, blarney is 7₺, Baklava is 6₺, Baked rice puding is 7 ₺. The price of the meatball is a bit high. Other prices are normal. 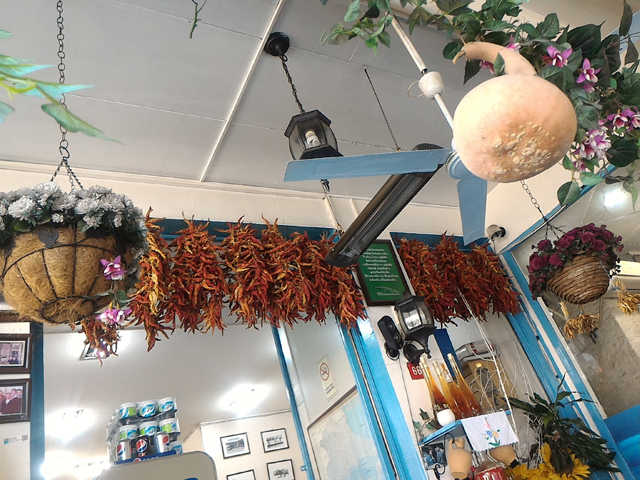 People usually order the meatball kinds from outside especially from the region it is located. The prices of portion meatballs are between 17 -34₺. If you want to taste mixed meatball plate; its cost is 34 ₺. They are serving fries, roasted pepper, tomato and rice with the meatballs. So, they have satisfied portions. I could not eat blarney due to I was full. So I did not evaluate it. 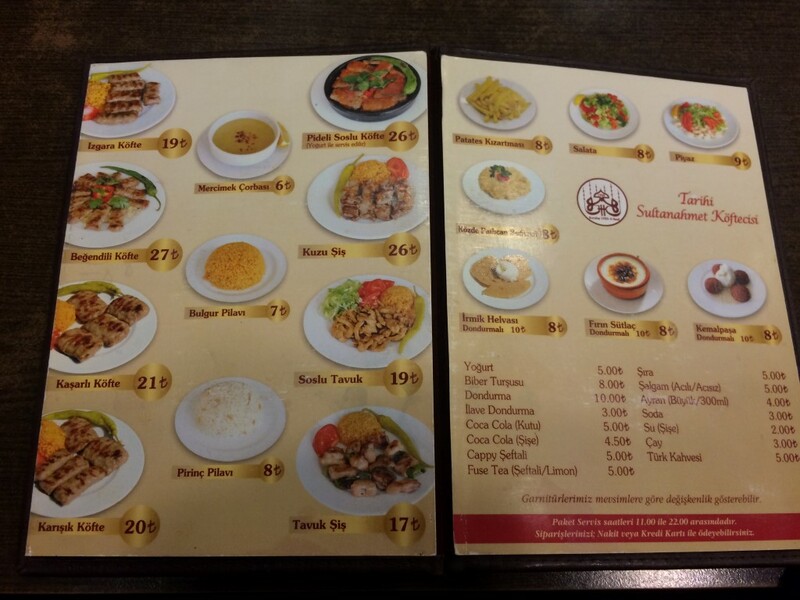 Grilled meat and chicken kinds are also available in the menu except meatball. 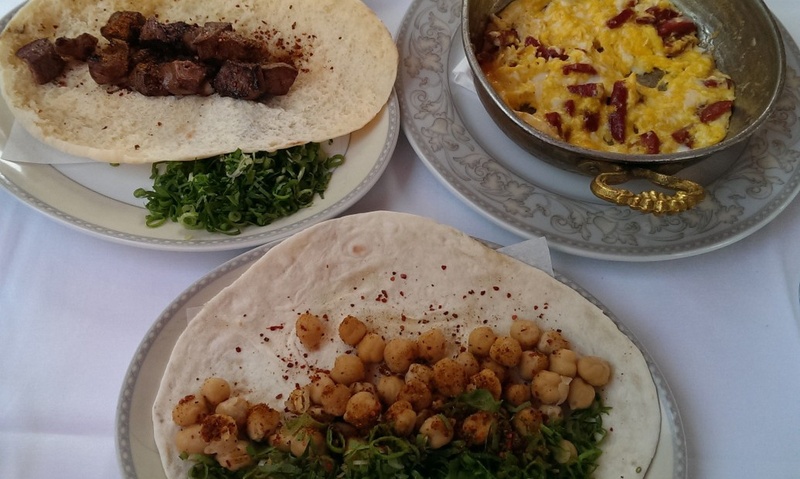 Especially, the most highlight kind is Köftehour special with its 17 kinds of spices. Other kinds are also delicious but not as the special one. 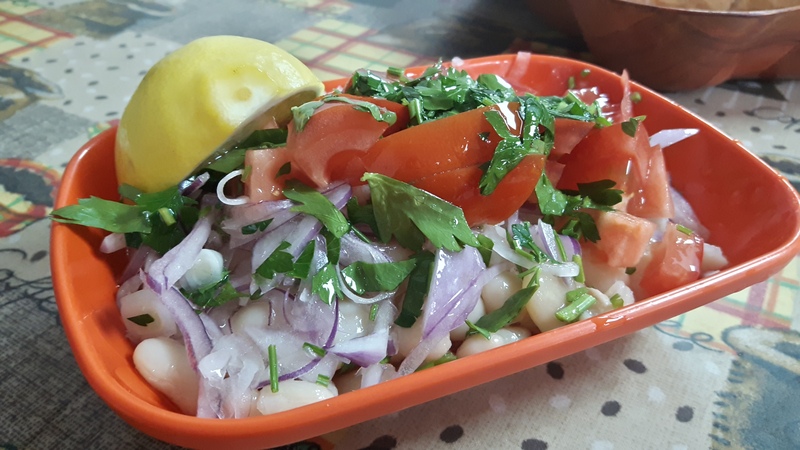 They have created a good alternative for Gayrettepe, Esentepe, Mecidiyeköy regions. It is not easy to serve so many kinds of meatballs. 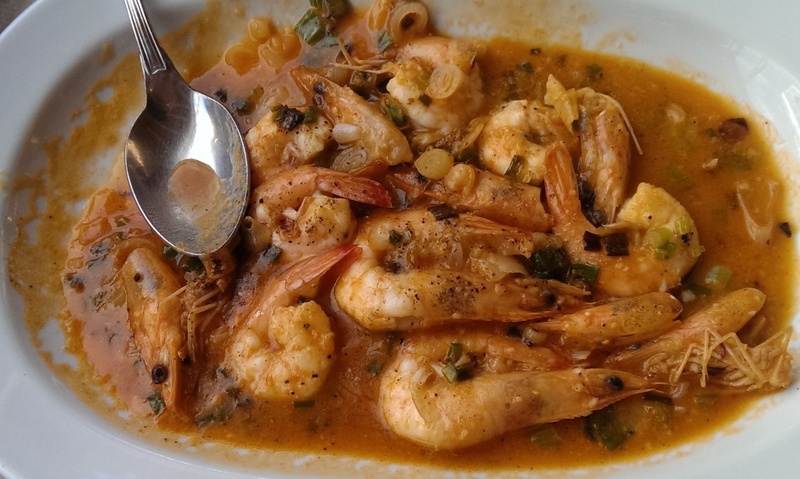 They are located in a region that is dense take away service. The inner sitting area of the venue is small but it is very advantageous being sitting parts at the outside area. 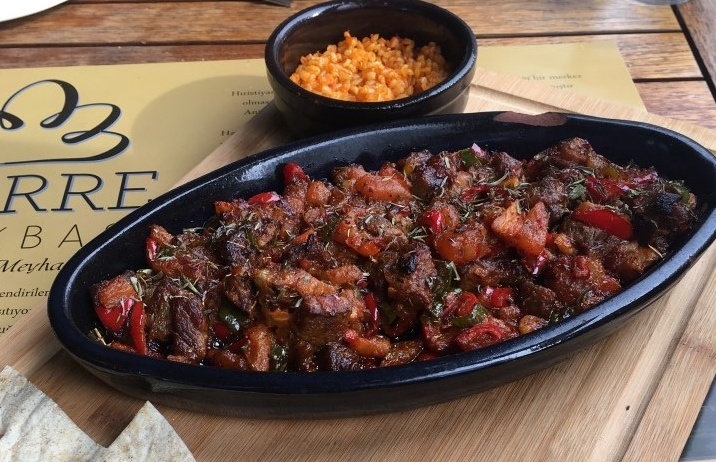 Taste: Köftehour special is a different taste with its 17 kinds of spice. Other meatball kinds are not as good as special one. Braising: I ate mixed meatball plate. 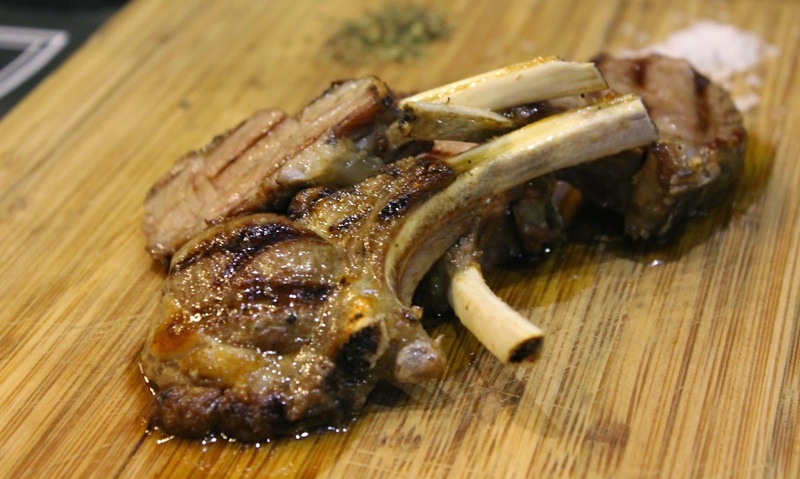 The braising time might not be the same for every kind. Some of them cooked to a turn, some of them were dried. 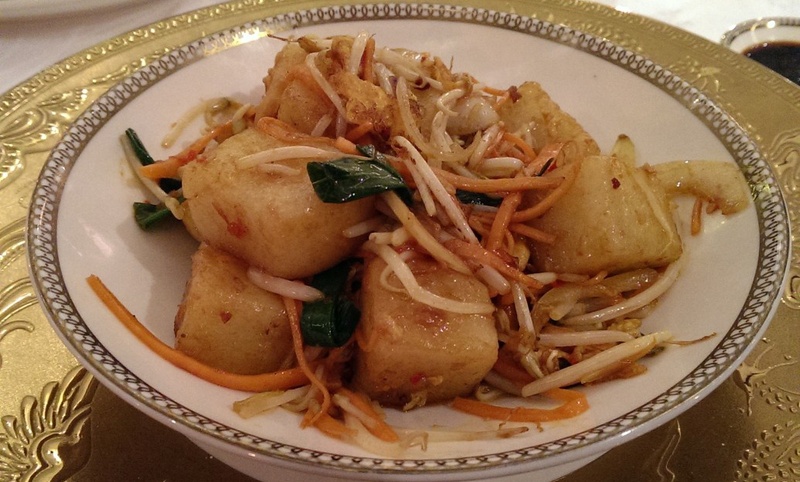 Portion Size: Portion is 200 grams and very satisfying with its sidings. Hygiene: It is very clean, newly decorated venue. It is perfect in respect of hygiene. Service: If you are not coincidence lunch time; it is very fast. There is a density of take away service. 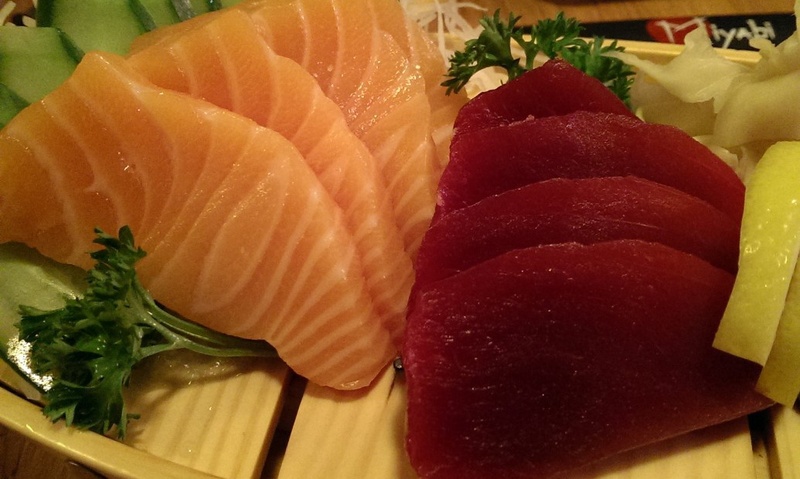 Price: Although the price is a bit high according to portion size; it is about the average price of the region. #KanGurular Fuat Ş.
Şişli Köftecisi is located on the back (çarşı) street of Şişli Mosque in Şişli county. It has been given service for 25 years. The venue is tiny. It has fourhanded four tables at inside area and one table at the outside for double. Visitors are having their meals fastly. Most of them are regular and fast food customers. Fatih Bey, son of the owner, Ahmet Bey is keeping on the artisanship. 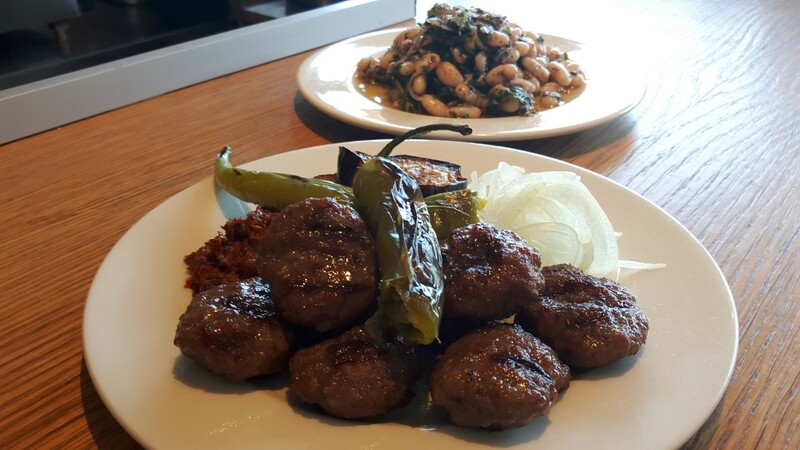 Fikri Bey is cooking meatballs; Hasan Bey is serving them. 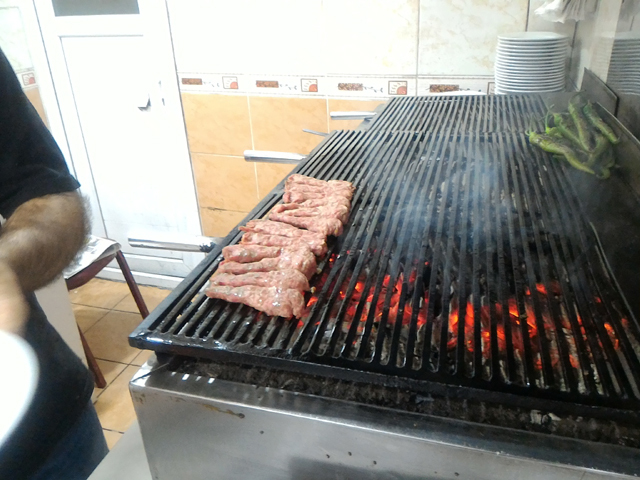 The meat is coming from Balıkesir and grilling coal fire. The cleanliness of the tables are inadequate. 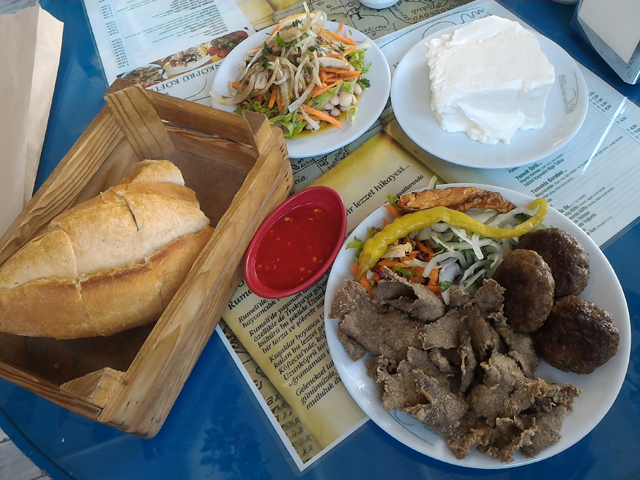 After we gave our order, fresh sliced breads and well-sauced blarney (5₺ ) came to our table in a short time. 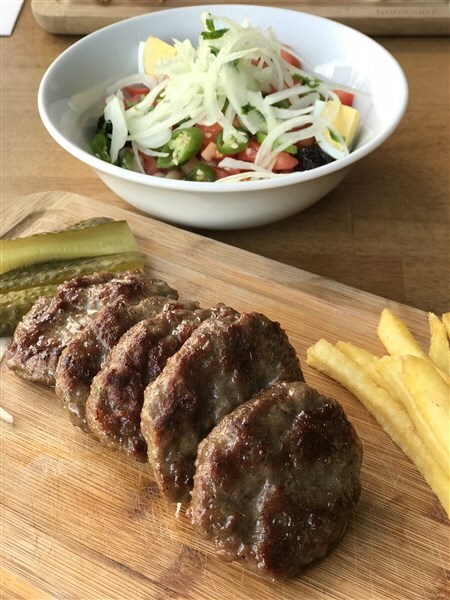 The meatball plate (13₺) is composing of 6 pieces of meatball, fresh sliced half tomato, rice, roasted pepper and hot sauce. Meatballs were light oily and delicious. They were butcher meatball style. The taste of the rice was below average. Because the rice pieces were different and their cooking time were also. There is no open butter milk. You have to prefer Sütaş brand butter milk. The venue is open every day 07.00- 18.00 except sunday. Credit card is available. They have also takeaway service. Taste: The taste of the meatball is average. Braising: The master is grilling flat meatballs on coal fire. Portion Size: The size of the portion is not totally satisfied. Hygiene: It is a booth venue. Service: Meatballs are cooking fastly. Your order is prepared immediately. 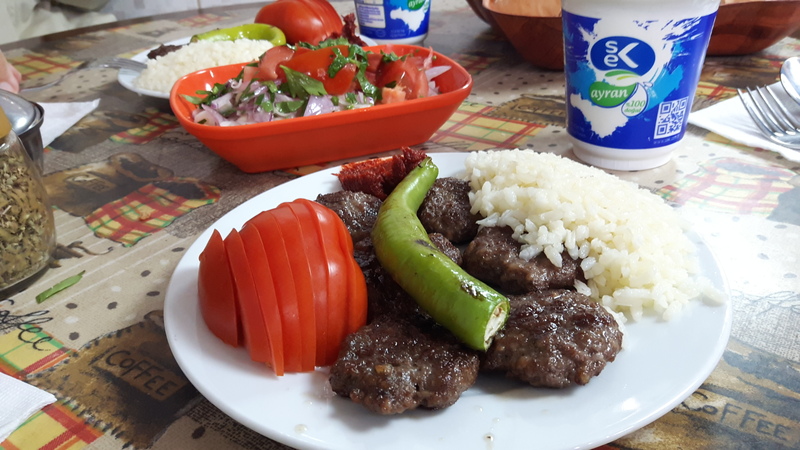 Price: The cost of portion meatball is 13₺, blarney is 5₺, Sütaş butter milk is 3₺ #KanGurular Ari D.
The venue is located at Balat neighbourhood about 82 years at the shore of Golden Horn. 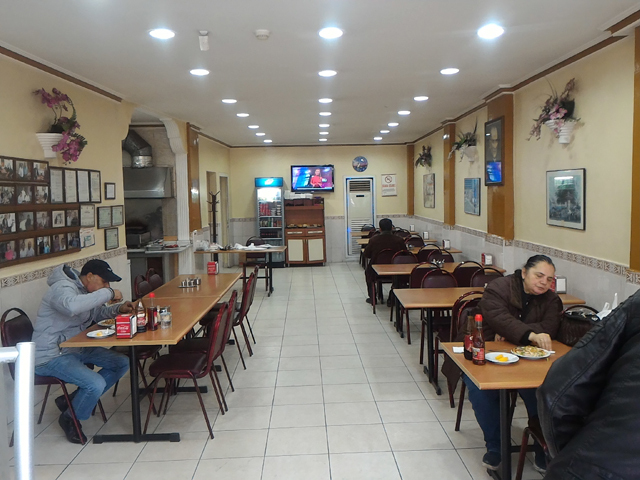 Its former name is “Blue Corner Restaurant” and it has been living along three generations. After the family members moved to Balat from Albania in 1910; the parent of the family, Rıfat İştay has worked in slaughter house. 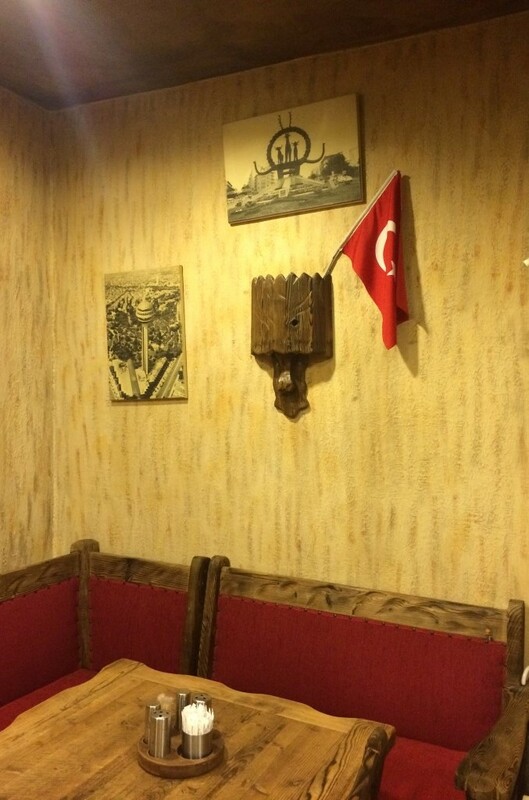 He has opened current venue in July 1947 with the incitement of his son, Ali İştay. The venue is not very big but it makes an impression on you that it is a busy business with its big, wide tables and regular customer profile. It is closed on Sundays. It is open on weekdays 06.00-16.00 and it is working an extra hour on Saturdays. 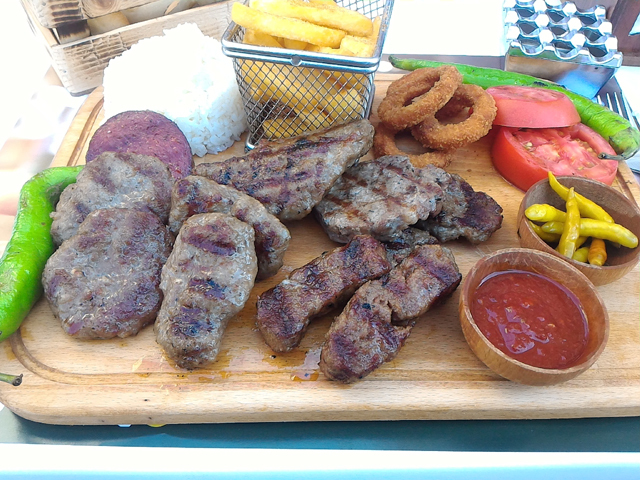 They are providing the meat from Afyon and Balıkesir. 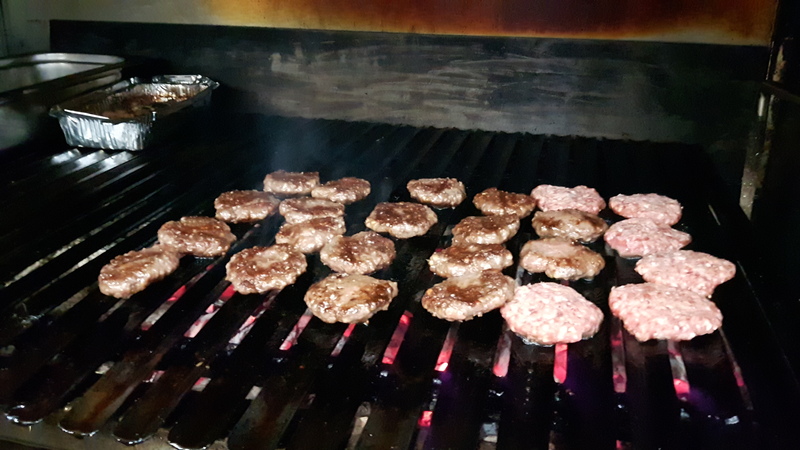 The minced meat is composed of %100 veal. They are using their own spice mixture in it. 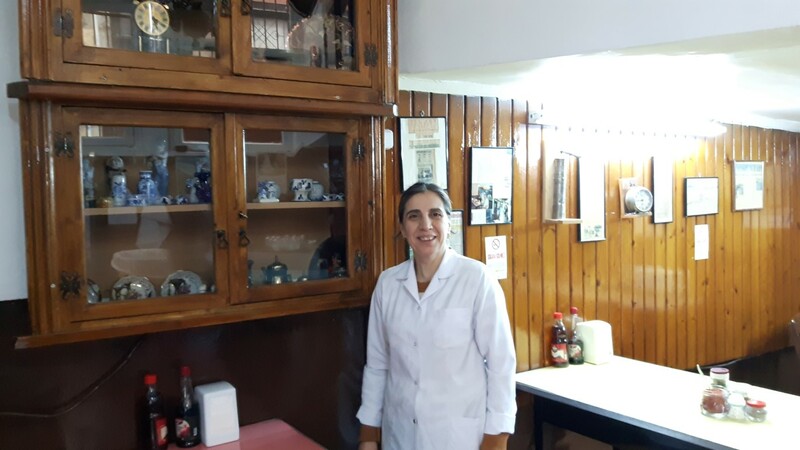 The Master Güngör has been cooking the meatballs since 1982 in the venue. The owner is third generation Mine Hanım. She continues the family work remained from her father Necdet Bey and her uncle Ali Bey. The objects decorated the walls of the venue remained works of her mother in law. These have created a nice vintage atmosphere. 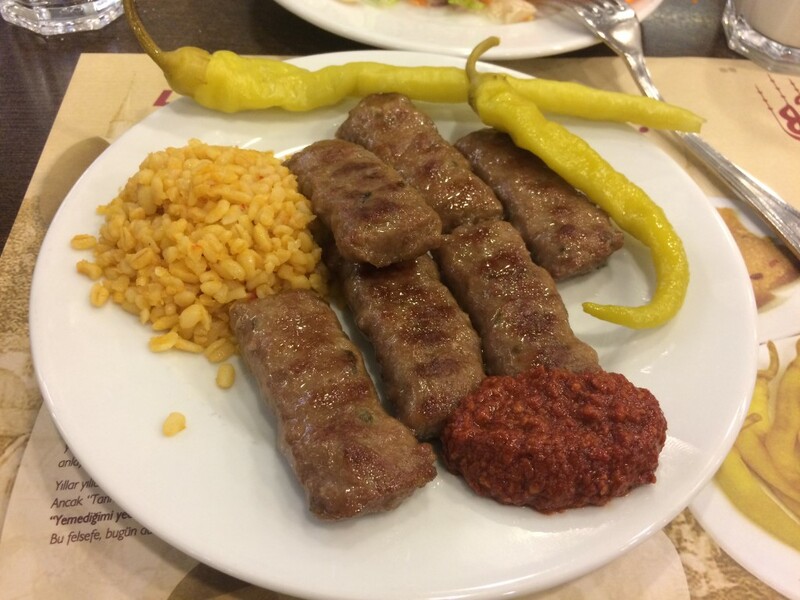 Meatballs are prepared by Hakan Bey. He is also responsible for service. Spices (salt, pepper, red pepper, thyme), oil and vinegar are drawing attention on the tables. Your order might be late, if there is a busy time. Firstly, the blarney with sliced onion and grated carrot was served. 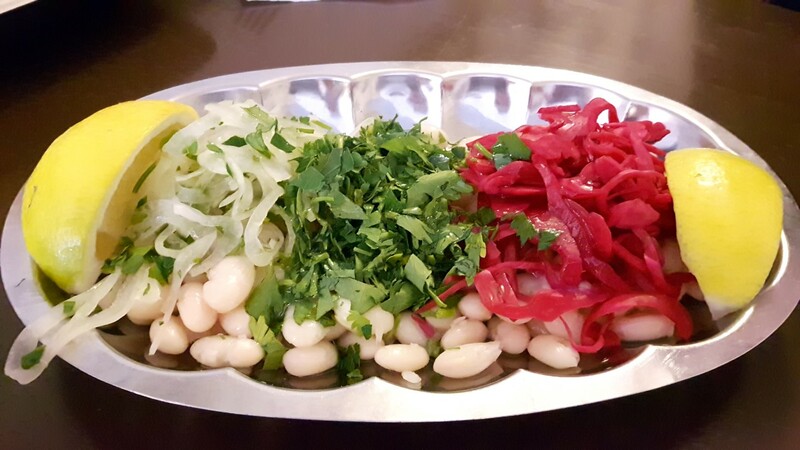 Beans have function of starter until the meatballs came. Portion is composed of ten tiny meatballs, again carrot and onion as siding. Unfortunately, there is no open butter milk. You can find SEK brand butter milk. 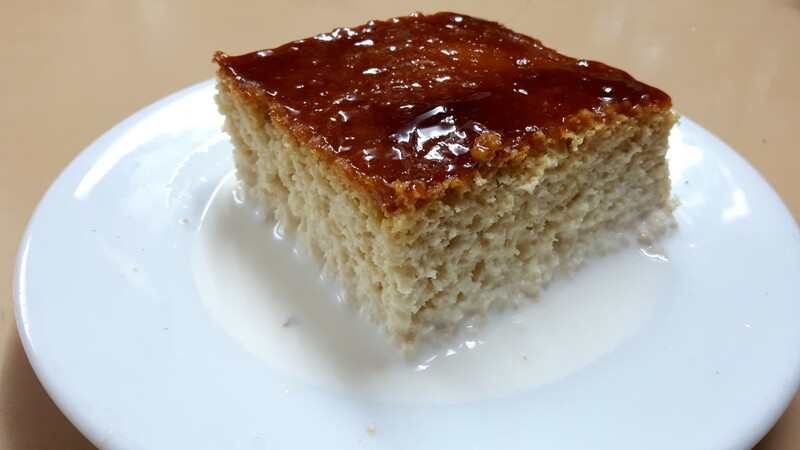 You should taste the Tres Leche made by Mine Hanım as dessert. 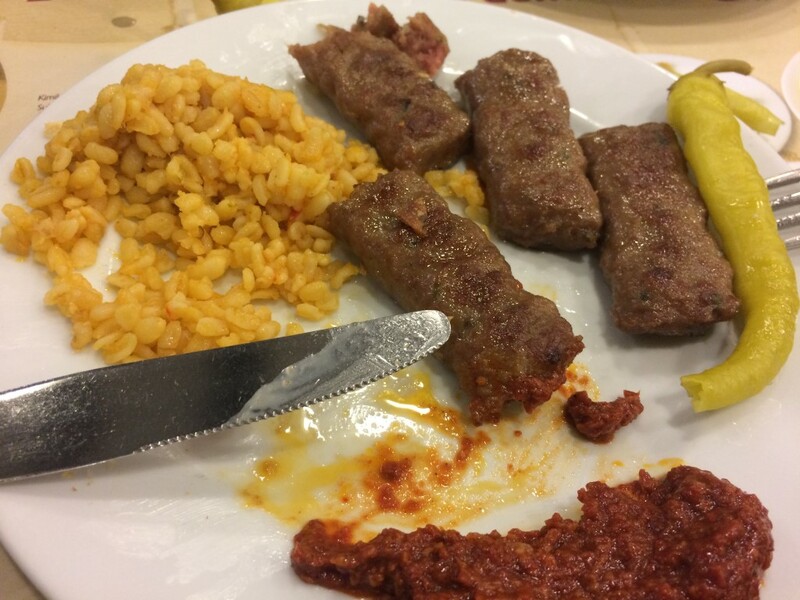 Do not cross Balat without tasting meatball and other tastes made by their sincere workers of Köfteci Arnavut located in a historical building. Taste: The taste of the meatball is above average. Service: Meatballs are cooking fast. But your order might be late because of density. 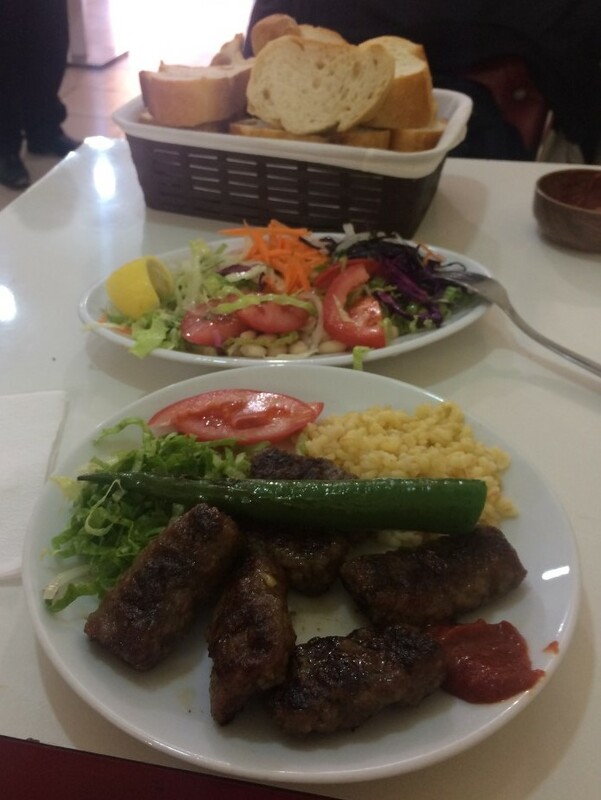 Price: The cost of portion meatball is 14₺, blarney is 6₺, SEK butter milk is 3₺ #KanGurular Ari D.
I went to second and only branch at Asian side of the a century old meatball restaurant always known with its branch located in Sultanahmet on a Sunday evening. The venue is managed by its third generation owners. Walls are full of objects telling its history and fame. Although there were meatball kinds like with eggplant, kashar cheese, mixed in the menu I ordered classic portion meatball and blarney duo. I preferred bottle buttle milk due to there was no open one. There is also Rifat Minare Brand stum and Kestane brand glass water. The venue has a vast sitting area. There is very lone when I went. I especially wanted the meatball as rare cooked. 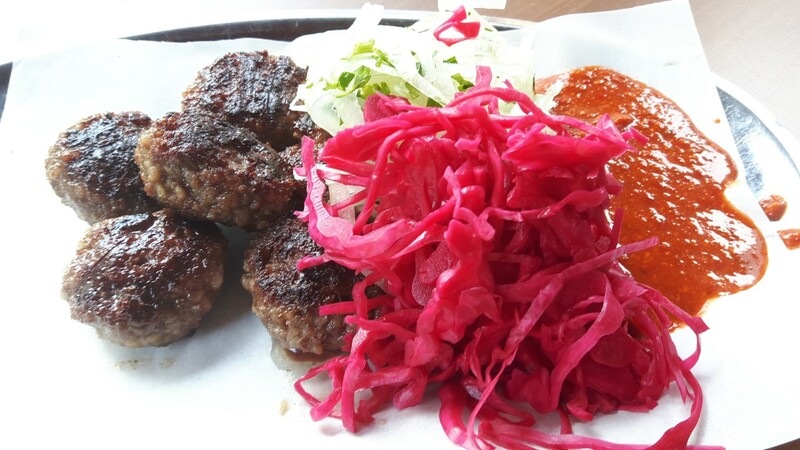 A plate consisting 6 pieces of meatball, 150 grams was came. 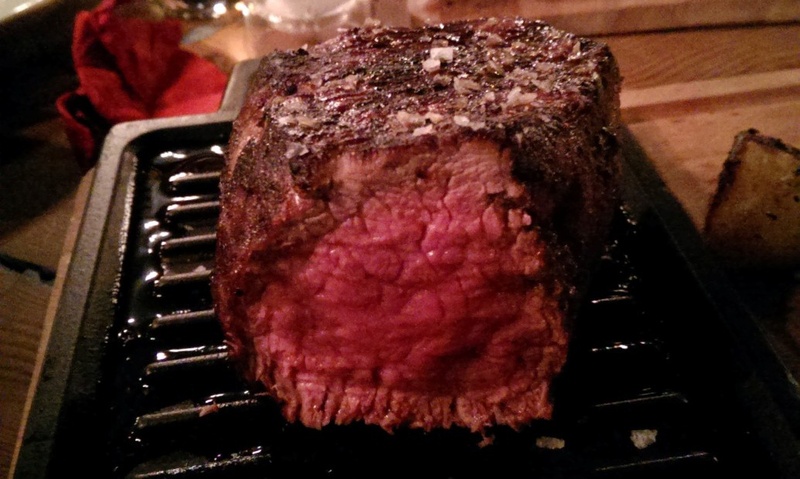 Though it was rare cooked its inside was dry. Its taste was standard. After a short time when the oil inside of it started to freeze; I felt that I ate an industrial type meatball. There were only two pieces of pepper pickle and one spoon of bulghur rice as siding. I searched grilled tomato, pepper. I did not eat very much as I do not like this kind of pickle. The rice was not bad. Thick hot sauce serving acccording to your wish was successful. Blarney was very bad unfortunately. Both its portion is inadequate and it was so plain. Beans were boiled too much. 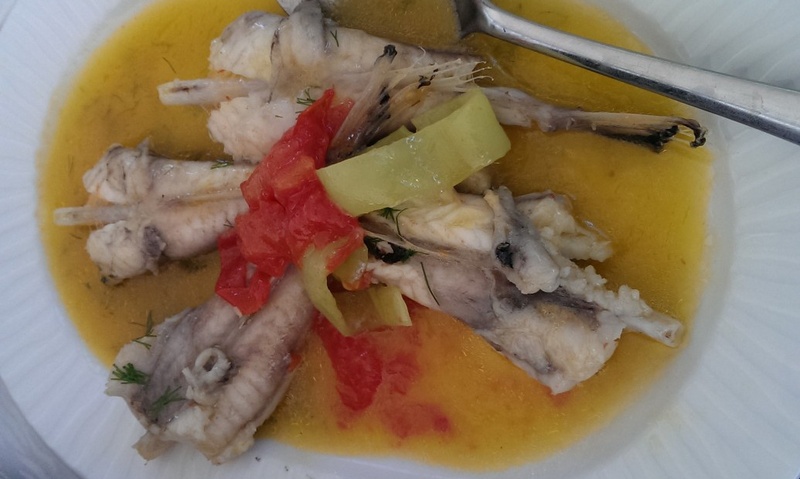 They did not serve any vinegar or oil sauce. I ate it partly. 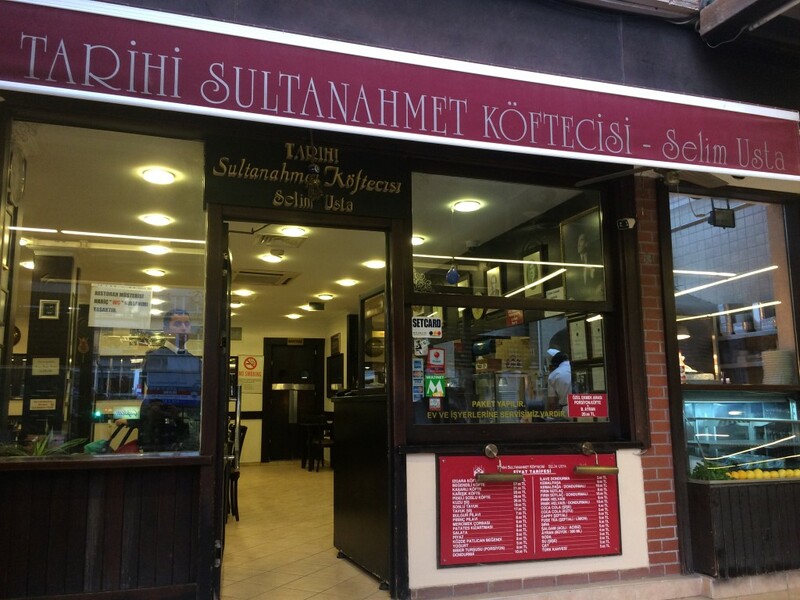 I have often heard the fame of Sultanahmet branch. This branch seemed me does not deserve this fame. 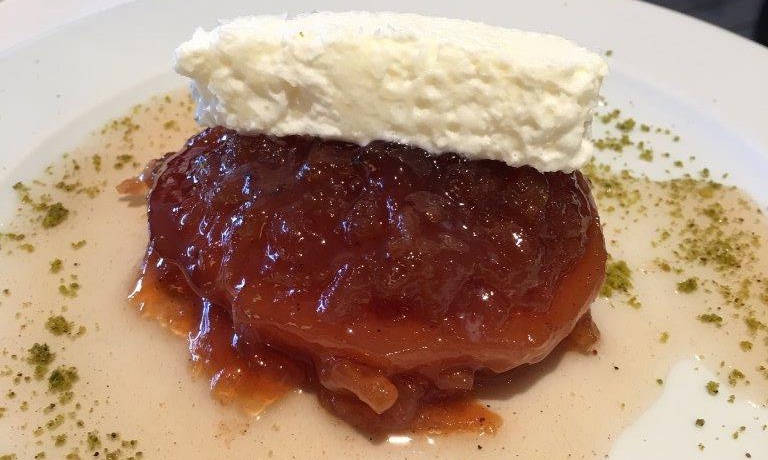 The semolina halva that I ordered as dessert was a bit sugary but successful in respect of taste. 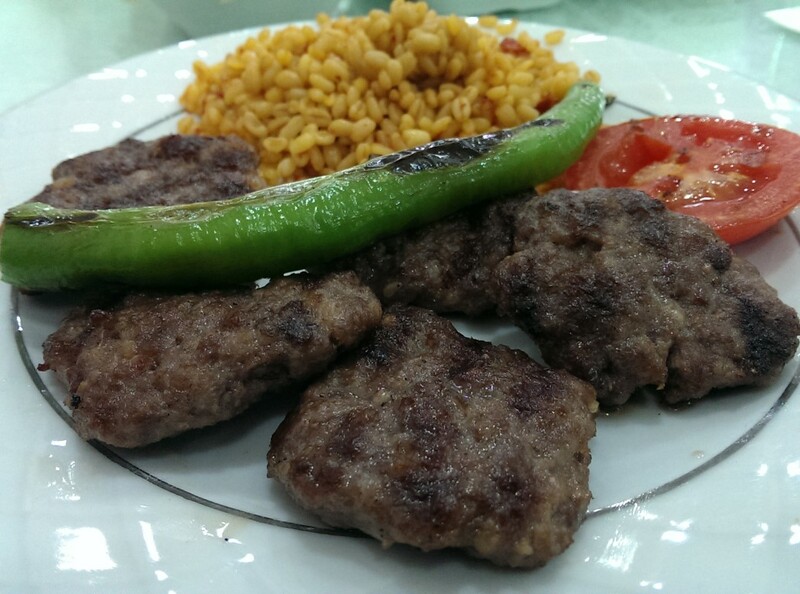 #KanGurular Erşen T.
Taste: I have read they do not share the formula of the meatball. 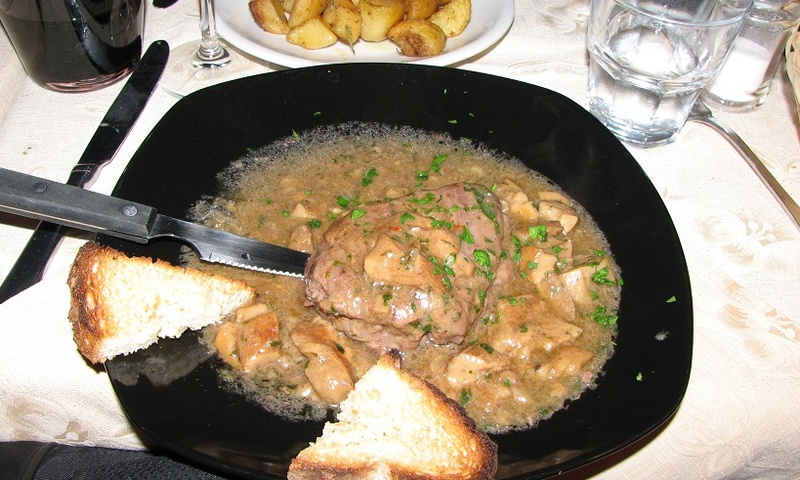 It is only said made from only veal meat, added salt and onion. There is no spice taste but I did not like very much. It hasa a standard taste and too tough. I do not know it consists tail fat or not but the frozen oil vision remained on the knife disinclined me. Braising: It was cooked as rare as I wanted. But its inside was not juicy. Its texture was hard. Portion size: The weight of the meatball is enough. It appeals to the eye. Siding support is weak. An alternative could be added instead of pickle. Hygiene: I did not experience any negative situation in respect of hygiene in the venue. Service: I had gone to the venue on a calm time. Service was made without getting late. Price: The cost of portion meatball is 19₺, blarney is 9₺, dessert is 8₺. The price might be accept as normal acccording to its weight but it is expensive in respect of taste. Especially blarney does not deserve its price. 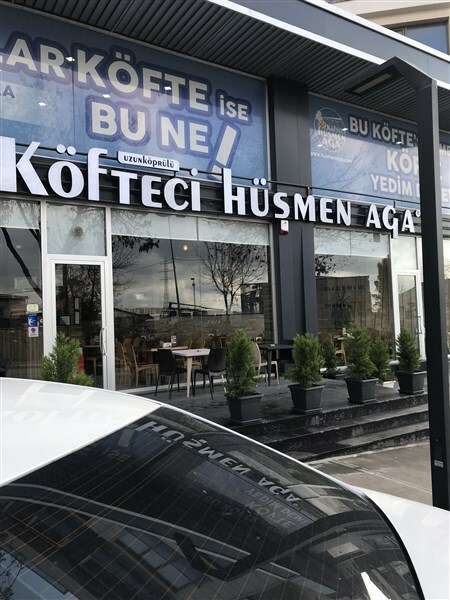 Köfteci Hüsmen Aga is a newly opened venue established at yenibosan in 2012. Its owners are from Uzunköprü. 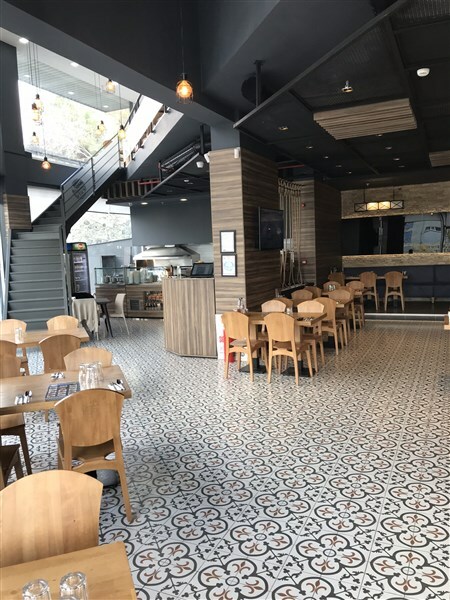 They have started to work with the motto of “ If they are meatballs; this one is what?” We have visited the new branch of the venue opened in Ambarlı, Avcılar. 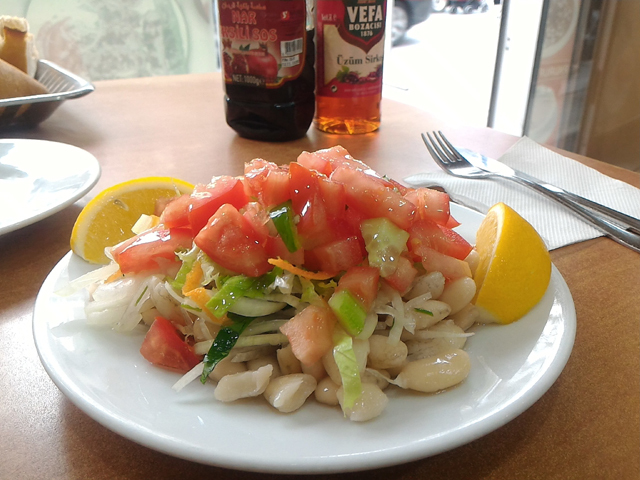 It is located on the avenue laying to Ambarlı from Gelişim University. It has a chic, hygienic vision. Wc's are very clean. There is no parking problem. They have avaliable spaces in front of it. 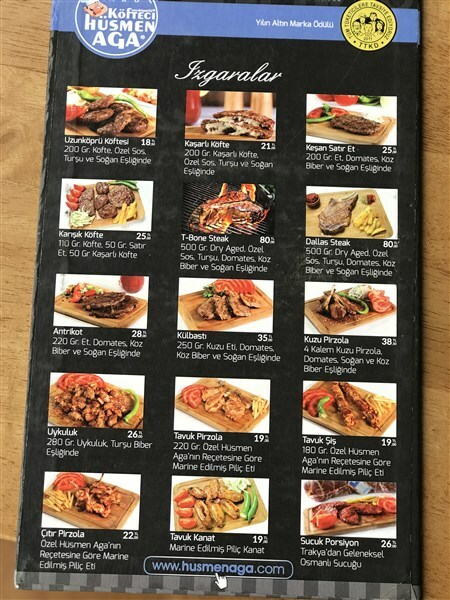 There are meatball with kashar, chopper meatball and steak kinds in the menu except Uzunköprü meatball. It is cooking on coal fire. 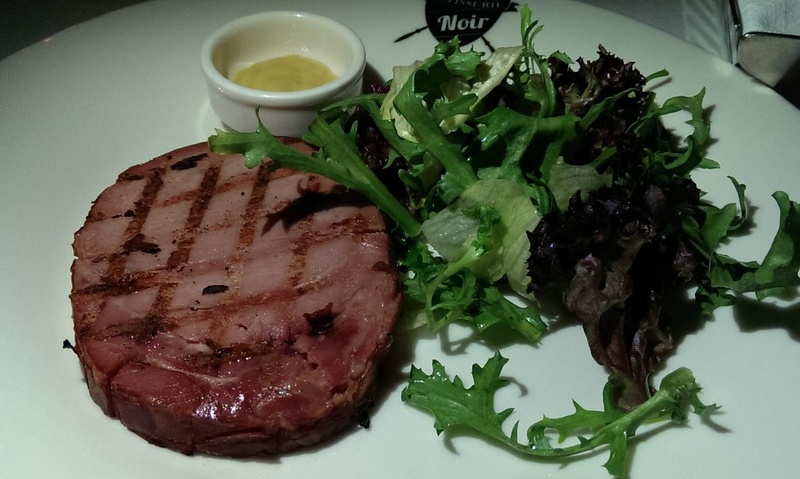 It is made of %100 veal. 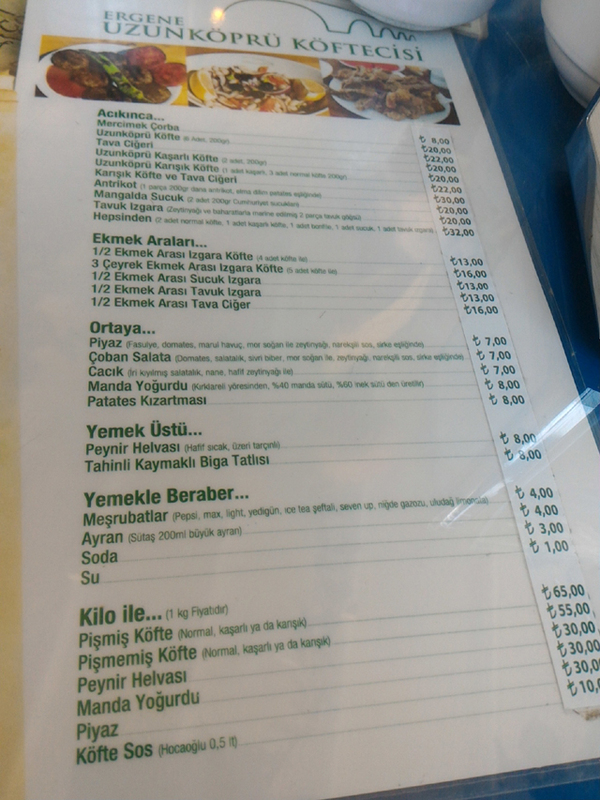 They are serving as 200 grams portion with hot sauce, pickle, onion and fries. 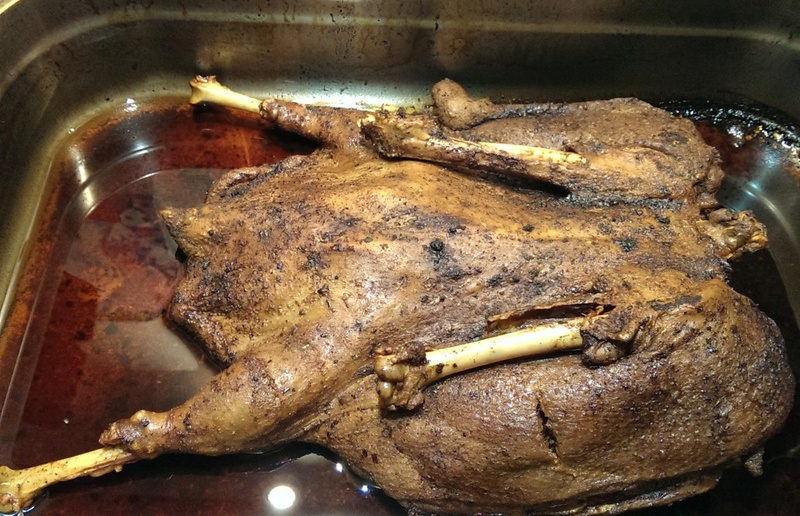 Its braising style is successful. Its juice has remained inside of it. Portion size is satisfying. On the day we visited black pepper was put too much. It was smelling black pepper densely. 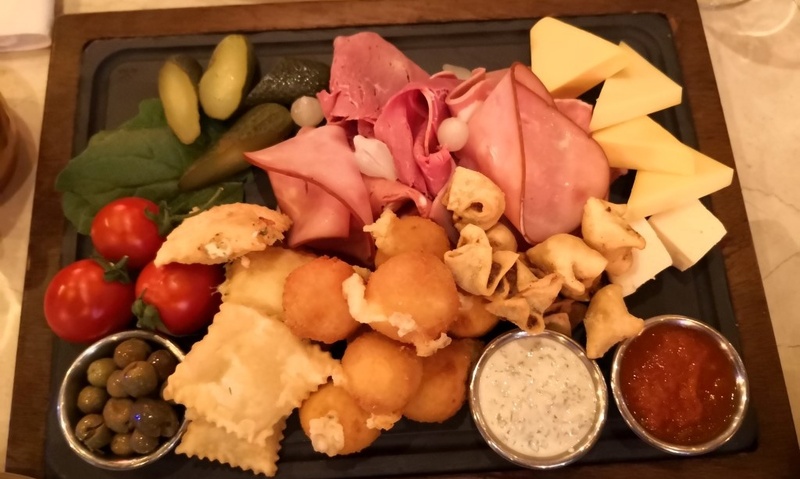 It is not nice to be served on wooden service. I prefer porcelain or cast plate. The portion price of the meatball is 18,50₺. It is normal. The blarney was a right one consisting olive and egg. I found it very successful. There is no open butter milk in the venue. They are serving bottle Eker brand butter milk. 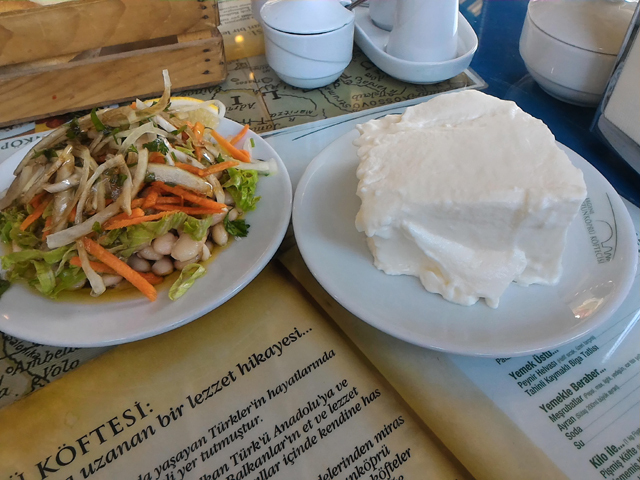 I did not eat Hayrabolu (reading as ayrabolu) dessert due to I was on a diet. I advise to the people serching for alternative in Avcılar region. Taste: It is not a very special taste. I can express it as average. Braising: It was nicely cooked without dried. 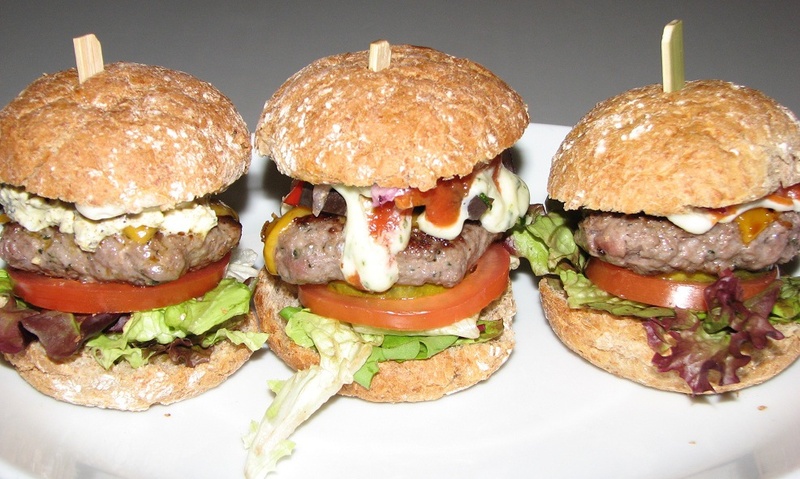 Portion size: The weight of the portion is 200 grams. Hygiene: It looks like very clean. Service: The meatballs came to table 10 minutes later from our orders. Price: The cost of portion meatball is 18,50₺. blarney is 6₺. 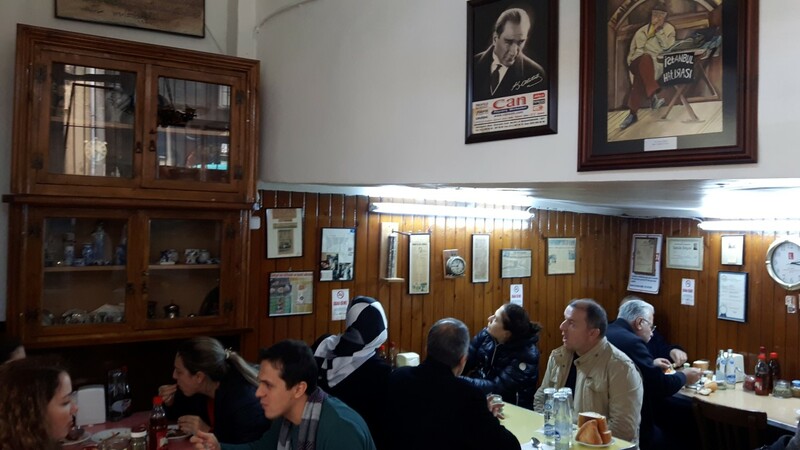 #KanGurular Erdi K.
I dropped by the meatball restaurant located on a back street between Nuruosmaniye Mosque with Cağaloğlu Slope on a late afternoon. There were only a few customers except me. 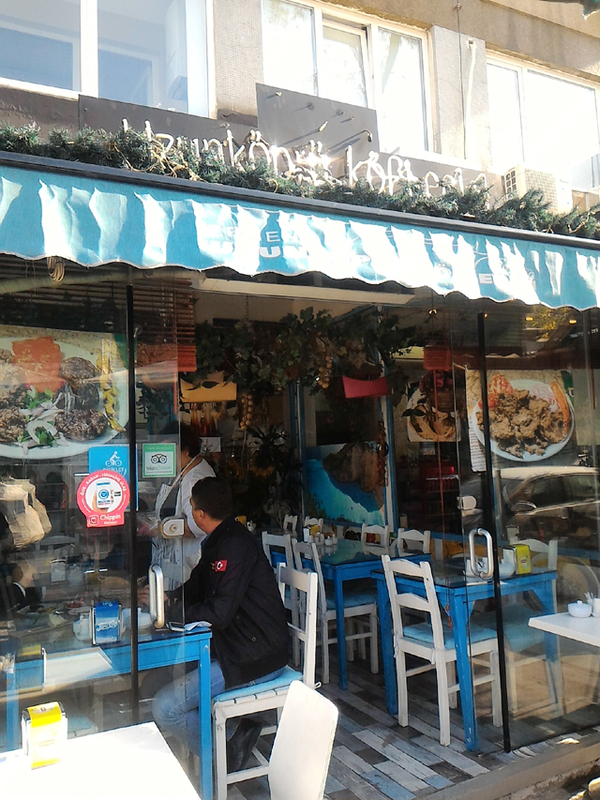 It was understood that it is a known venue and having a lot of regulars in the neighbourhood. I ordered one portion meatball and blarney. 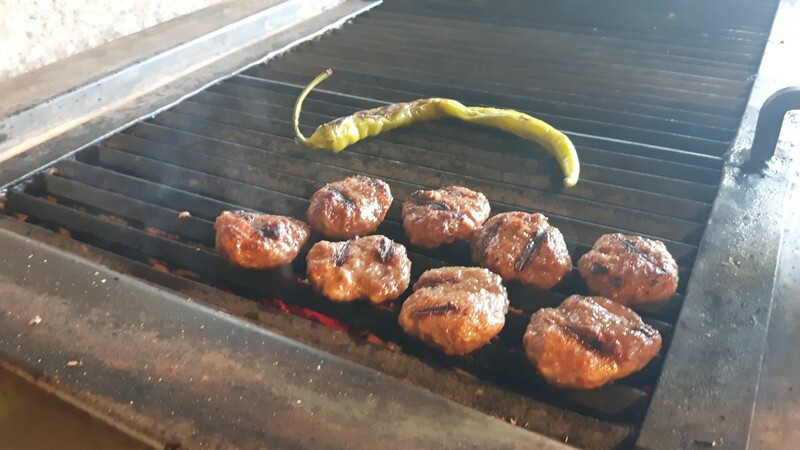 Meatballs were given from a tiny meatball pile that cooked before and waiting next to the grill. It was hot but naturally it was not like fresh meatball. The venue has a plain decoration and a booth atmosphere. 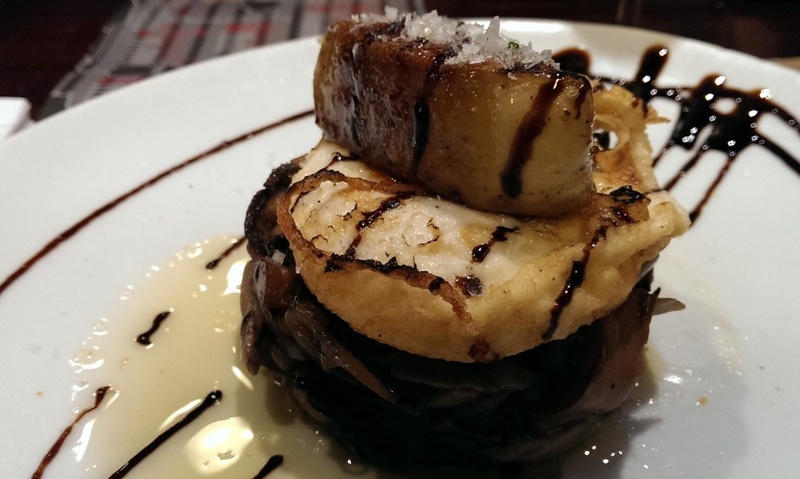 Taste: The meatball is made of totally veal and grilled on coal fire. It is nice not to dominancy of spice but the level of taste is standard. Only onion and bread being added into it. Braising: Due to they have serviced me cooked meatballs before; I had not chance to eat light cooked and juicy meatball. Its grilled level was normal. It was not burnt. Though there was no density, I do not know why they cooked before. Portion Size: If you are hungry; you probably will not satisfy with one portion meatball. 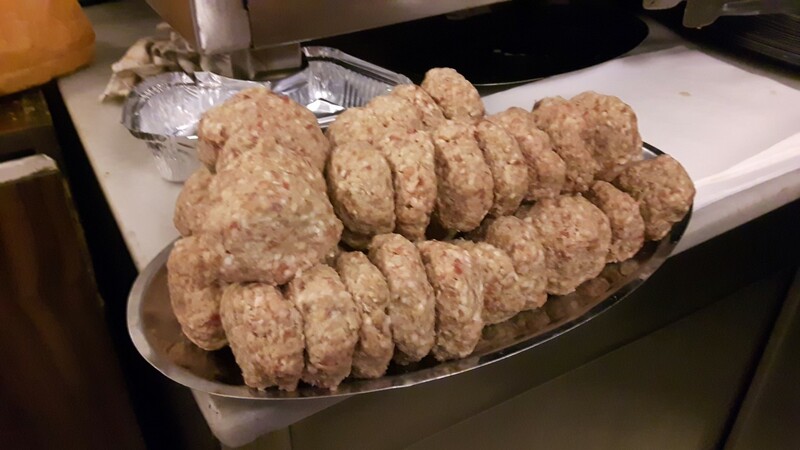 The portion is composed of 6 pieces of meatball, about 120 grams weight. Siding support and blarney were also inadequate. Siding support should be increased as the taste of the paste. Hygiene: I did not found successful in respect of hygiene because of carrot and lettuce pieces on the floor. Service: As there were a few customers and the meatball was already ready; service was very fast. Price: The price of portion meatball is 13₺, blarney is 6₺. The cost of the meatball is normal according to portion but blarney is remaining expensive. 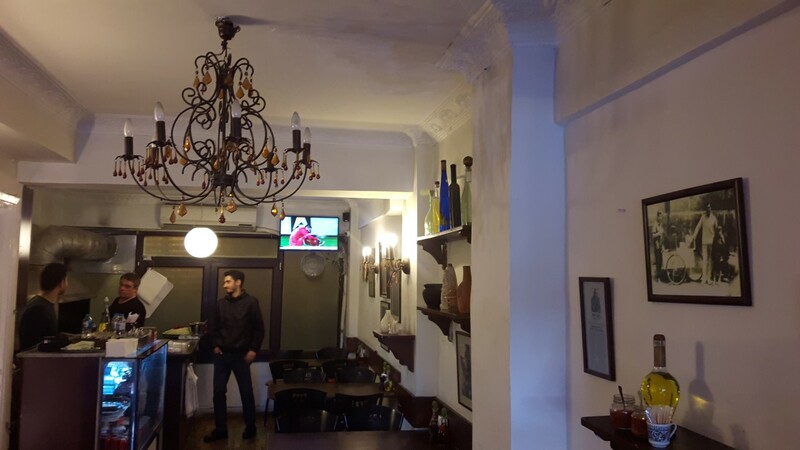 #KanGurular Erşen T.
This venue is located on the cross of Beşiktaş district bazaar. It has been opened in 2008. Their owners are from Uzunköprü so also its name is. Though it has a busy location, I felt that the general atmosphere of the venue is soulless. 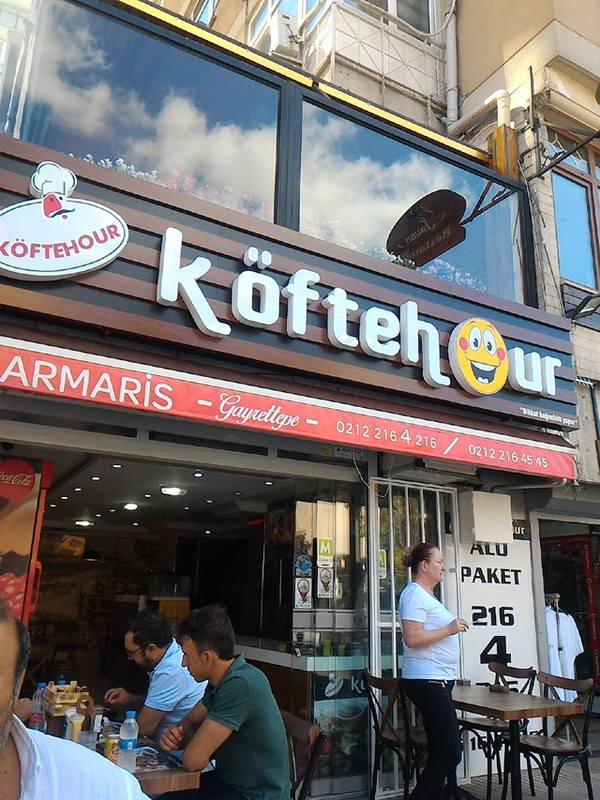 You can find Edirne style liver, meatball and soudjouk in here. 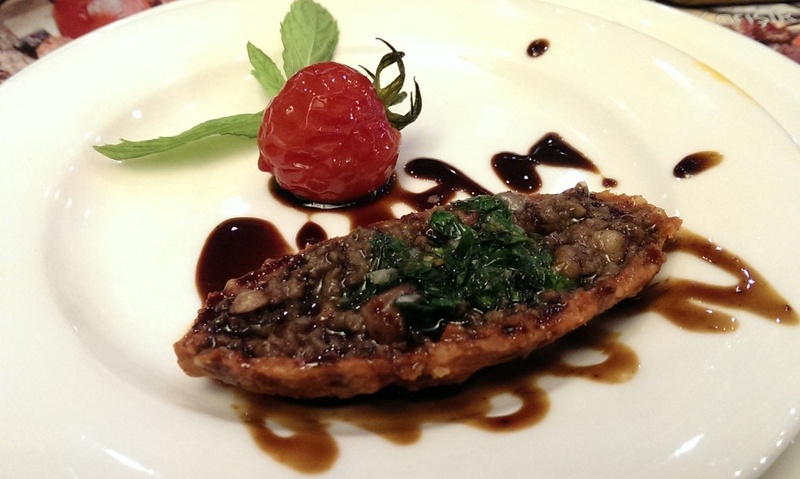 When we saw the liver in the menu, we wanted to try both it and meatball. 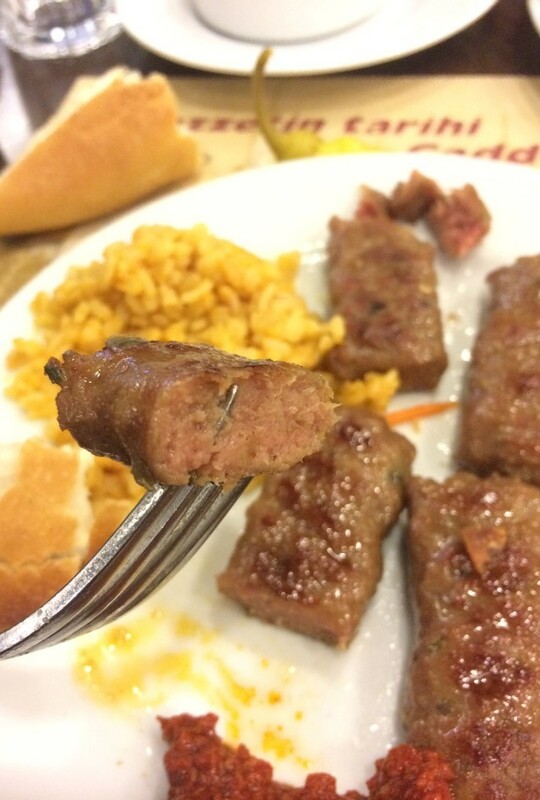 Honestly, I do not like this kind of pan fried liver but their meatball is not bad. 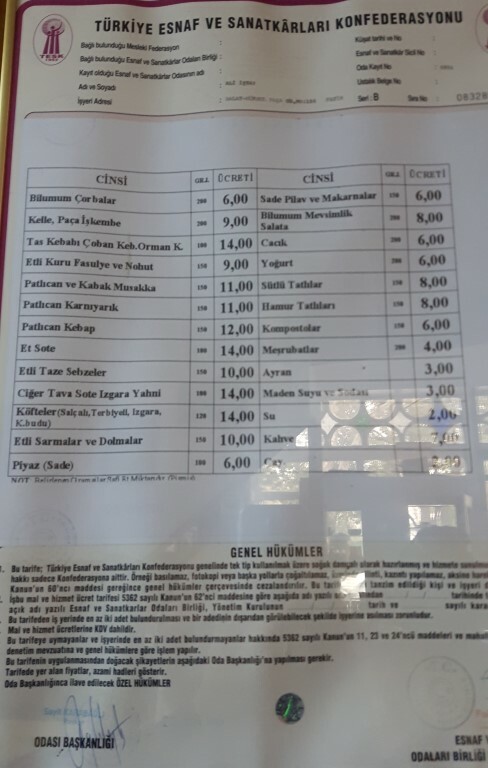 The portion price of Uzunköprü meatball is 20₺. 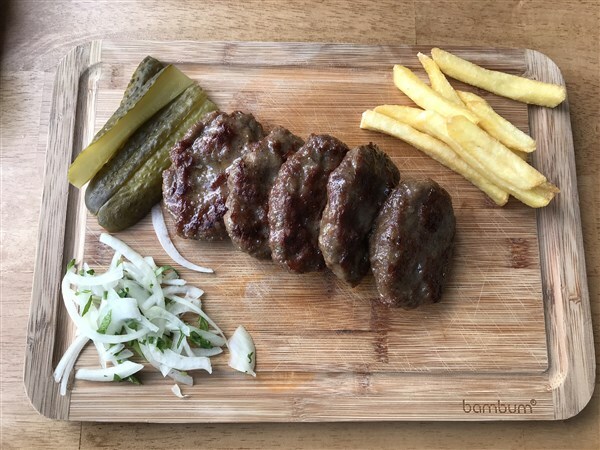 If you want mixed portion as liver and meatball; its price is 22₺. but they are also giving a huge portion yoghurt with portion plate. So there is no need to order butter milk. We also ordered blarney. The ingredients of blarney were in fridge. 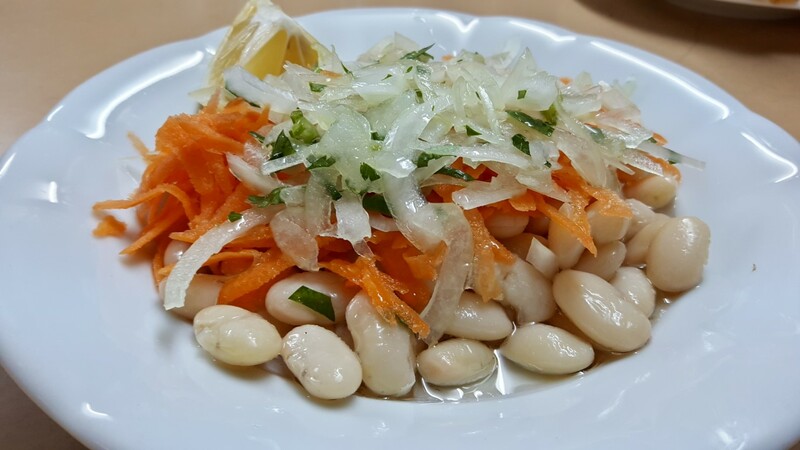 Bean, carrot, lettuce and onion put in plate and serving with olive oil, pomegranate sauce and vinegar. Actually, except pomegranate sauce tomato, green pepper, parsley, olive, lemon juice and boiled egg are also vital for the blarney for me. All these ingredients (except egg) should be mixed in a deep bowl to penetration all tastes with each other. But most of the venues do not make in this way. So, we found blarney tasteless. We want to emphasize this as footnote to be given importance the blarney. Because it is not adequate to make a good meatball. 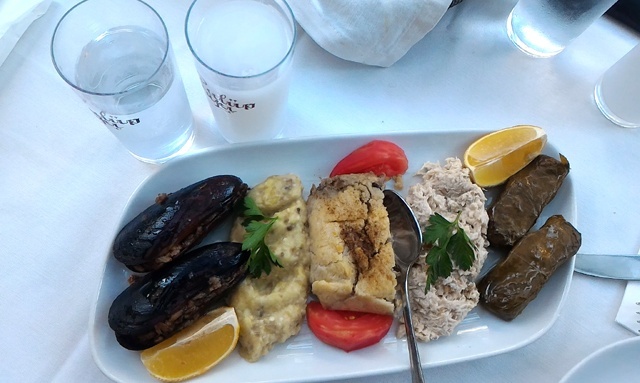 All kinds of tastes you serve should be complete each other. 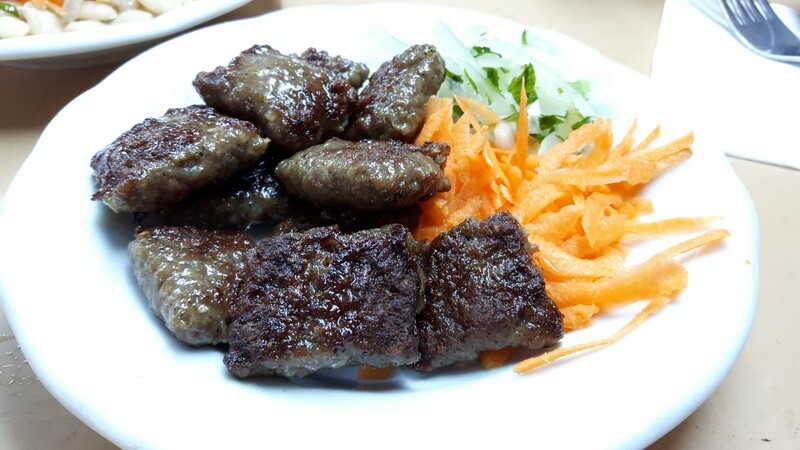 Taste: The grilled meatballs are more delicious than pan fried liver. Liver is veal liver and I found it a bit plain. Braising: The round shaped meatballs are juicy and full. 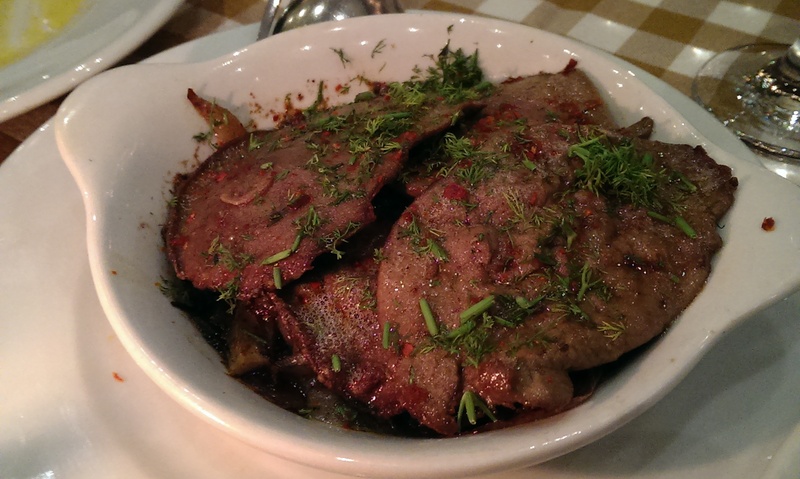 Fried liver was average in respect of vision and braising. 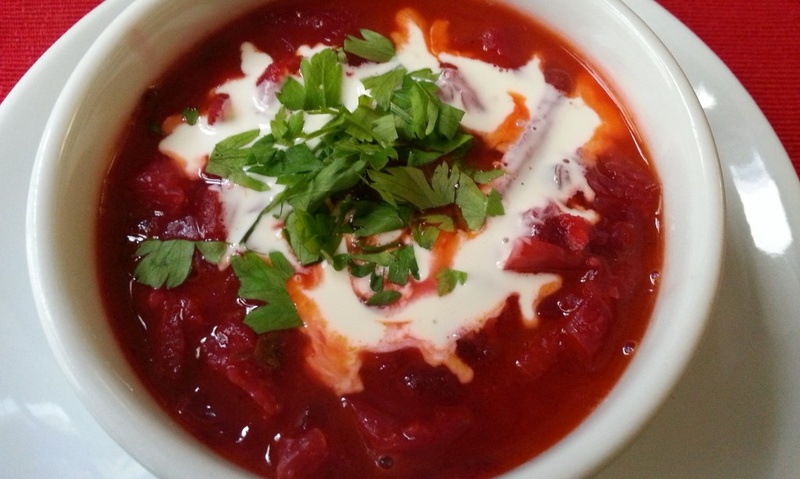 Portion Size: Its weight is 200 grams and very satisfying with carrot &onion salad, yoghurt as siding. Hygiene: The subject of hygiene is a subjective issue. I usually examine the every part of the business, especially wc's in respect of hygiene. The vision of the wc was negative in this respect. 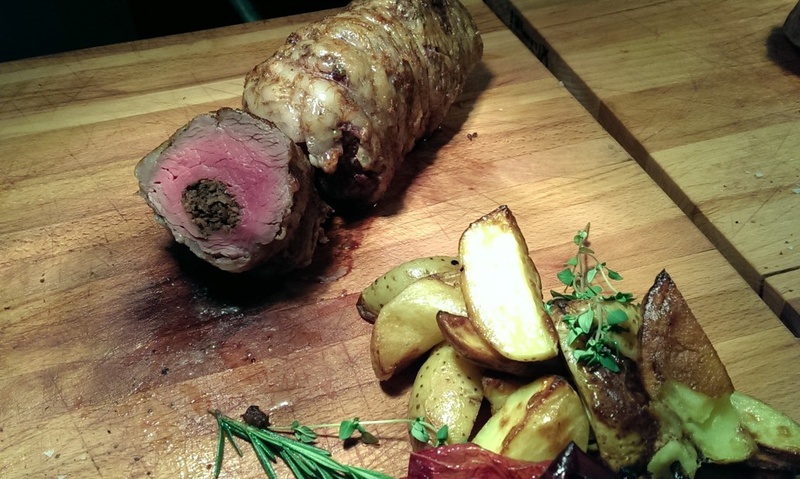 Service: When you order in the venue; they start to preparation in an easy way. As I went to afternoon, my orders did not get late. Price: The portion price of meatball is 20₺. It is a good price for this amount. #KanGurular Fuat Ş. 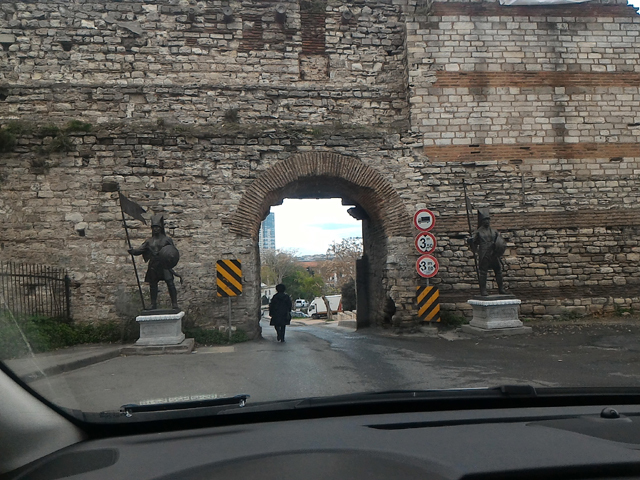 The venue is located in Yedikule after passing the Samatya Safa Pothouse, on the same direction with it towards to Yedikule walls. The outside vision of the venue is not very charmy but most of the customers have come from outside neighbourhood. I liked to have take away service. Because my residence is close here, so I can give order when I want it. 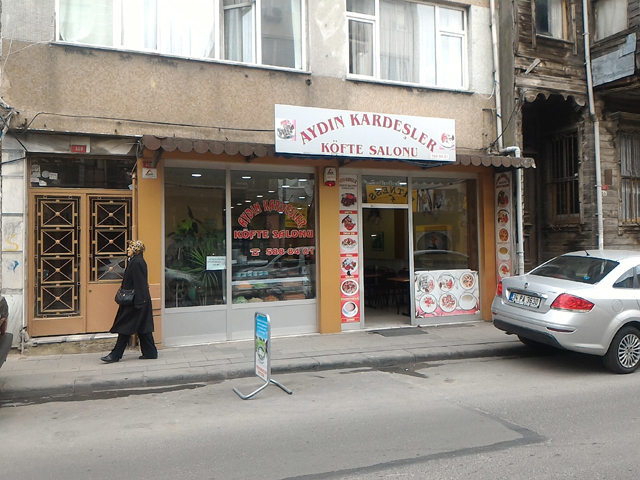 The owners of the venue is a few brothers from Batman and their surname is Aydın. So, the name of the venue has become Aydın. 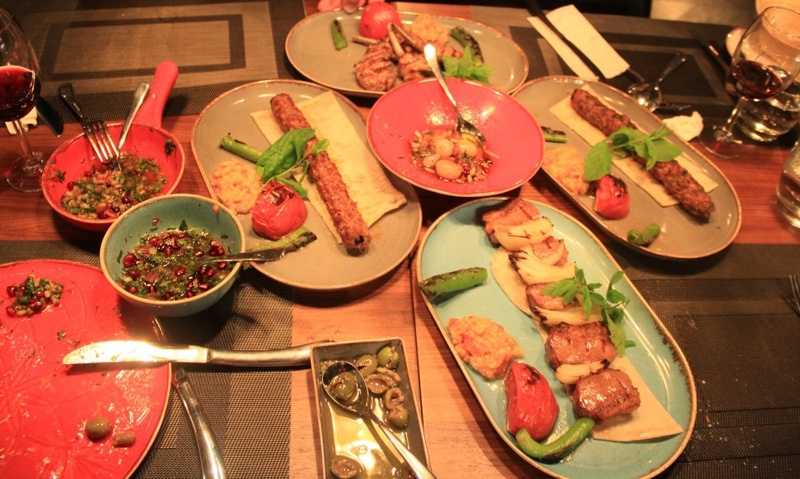 Firstly, they have started this business in Samatya, across of Ali Haydar. They opened this current venue in 2000. The portion is consisting of 6 pieces of big and long meatball, roasted green pepper, carrot salad, onion, a sauce composed mixture of tomato & pepper paste and red pepper. The meatball is only made of rib part of veal. It was knead with salt. It was a soft and delicious one. Its portion price is 14₺. I also ordered blarney. I can say that I have eaten the most delicious and closest blarney to the blarney norms in here. 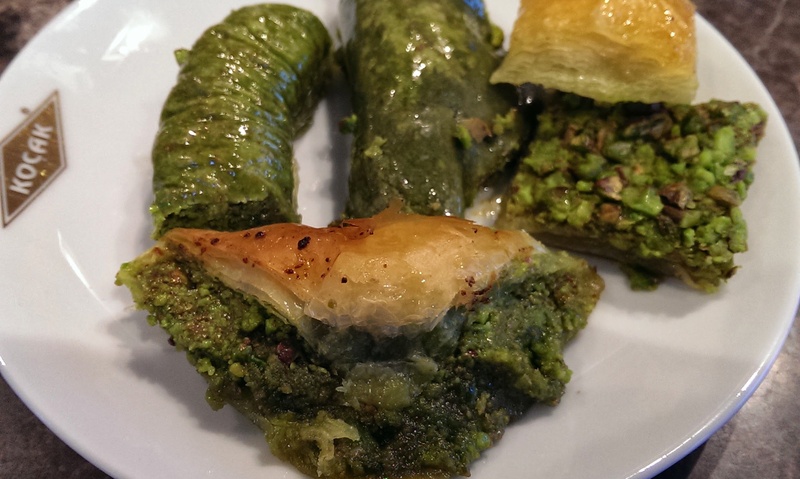 Of course except the cucumber added inside of it and not added olive, egg, parsley into it. 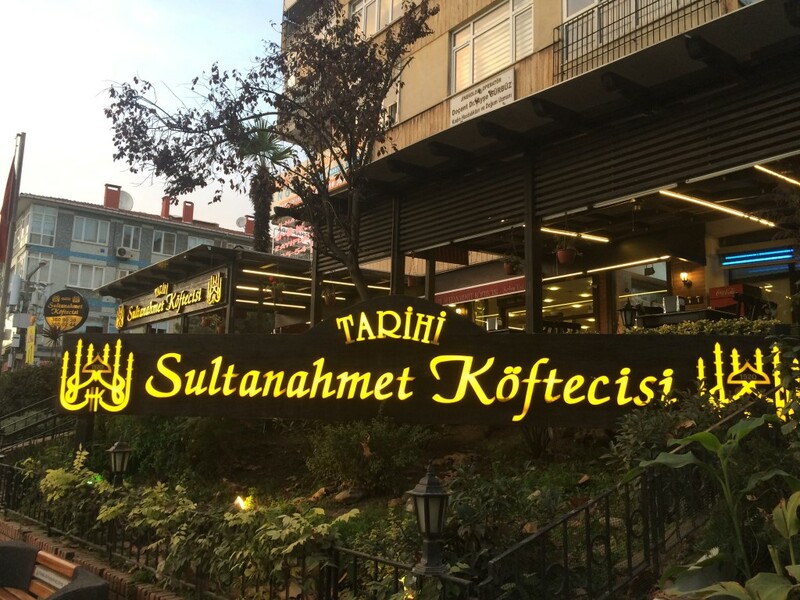 They offer Sütaş brand box butter milk. 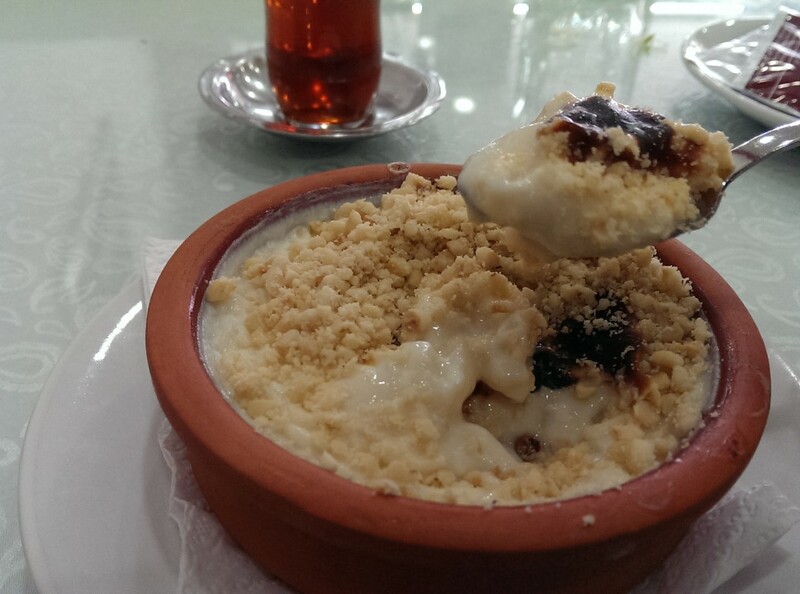 There are rice pudding and kadaifi choices as dessert but I did not prefer. I found very successful the venue in respect of cost/performance. Taste: Meatball is daily prepared using rib part of veal and adding only salt. It was very soft and delicious. Portion Size: The portion is very satisfying with its 6 pieces of big, long meatballs and its veggie siding. Hygiene: The decoration and toilet of the venue is old. Ity could be better if they renew WC part but I did not experience any inconvenience in respect of hygiene. Service: I went to the venue at noon. It was not so busy. It is a typical artisan venue. Smiling faces, tea offering etc. Price: The price of portion meatball is 14₺, blarney is 5₺. Butter milk small one is 1₺, big one is 2₺. I loved here in respect of cost/performance. #KanGurular Fuat Ş. You can have difficulty when you search for the location of Yasu Baba Meatball Saloon in Google maps because the pin of the venue is wrong. It was seen at Reşitpaşa Square. After you finished the Tuncay Artun Avenue by walking 800 meters; the road is curving to the left. 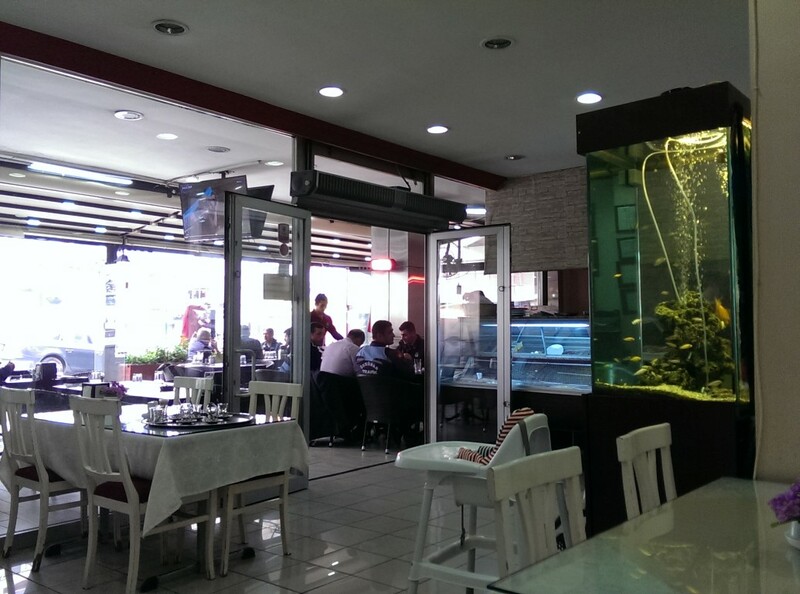 As soon as you turn you will see the venue is located between Şok Market and Hayal Et Steak House. 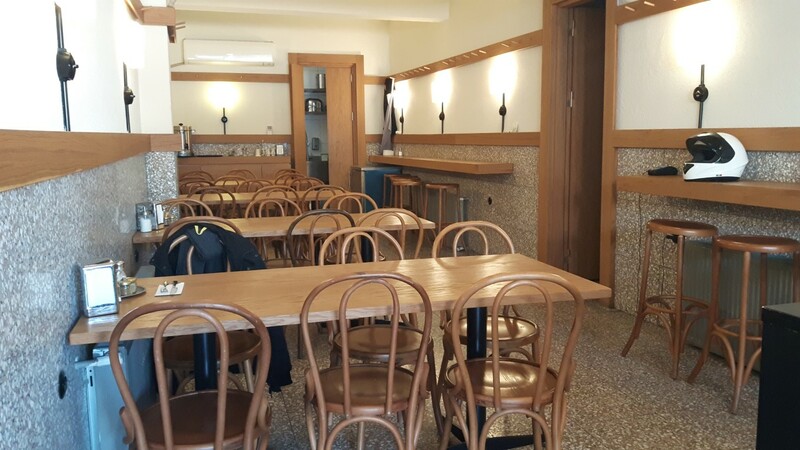 There are three tables for double each at the outside area while there are four tables for six person each at the inside. Except them, there are also stools. Take away service is in demand at Yasu Baba. 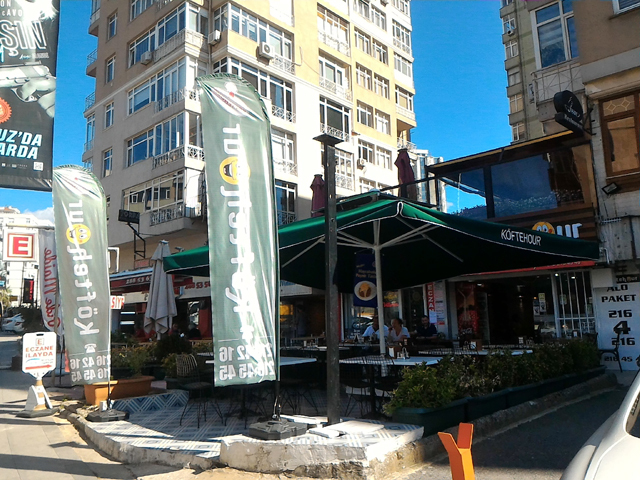 The venue usually experiences calm weekends and more busy weekdays because of the occupation of ISE in the neighbourhood. Although the manager of the venue, Bahadır Bey said that he had called google and make corrected the location, this boredom still continues. So it might be difficult to find the menu for the first time visitors. The venue has been working for two years. 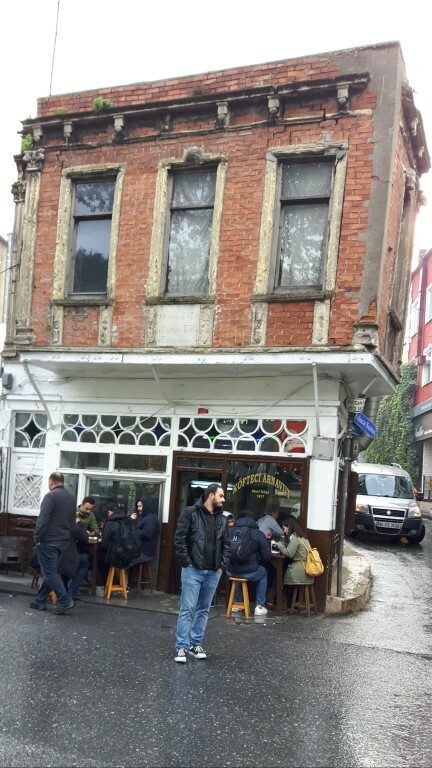 Bahadır Bey has made managership at Münferit (Cihangir) and Gaspar (Karaköy) before. 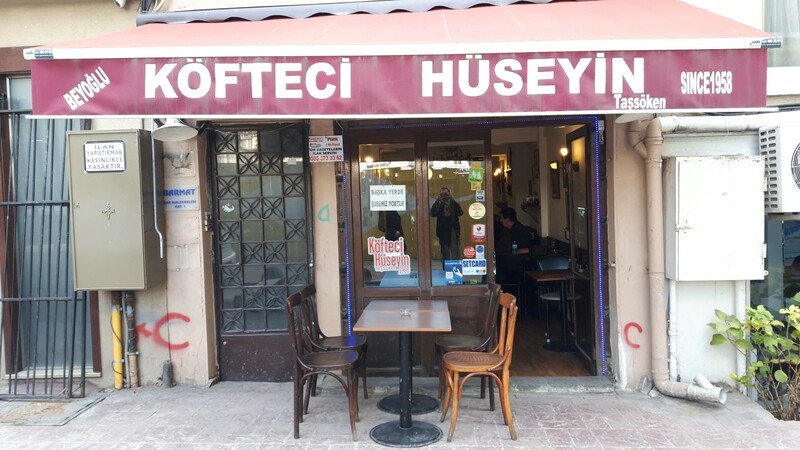 They opened its 2nd branch of it at Seyrantepe. Their 3 rd branch is under construction now about Profilo Mall in Mecidiyeköy. 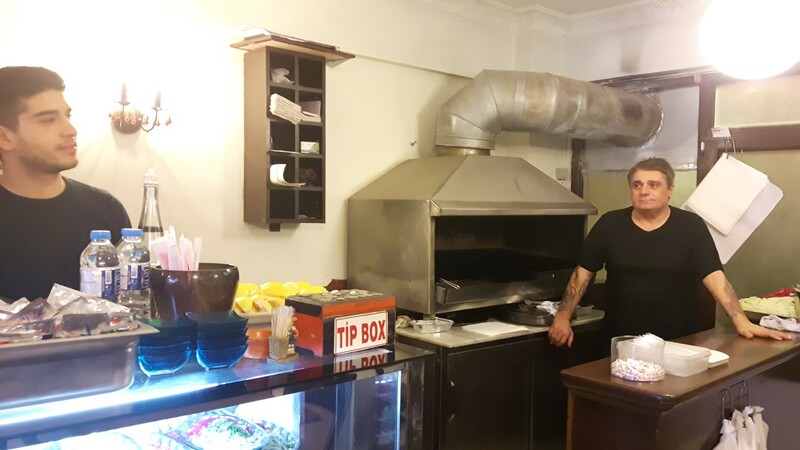 Ozan Bey is responsible for the service, Master Serdar is grilling the meatballs on coal fire. 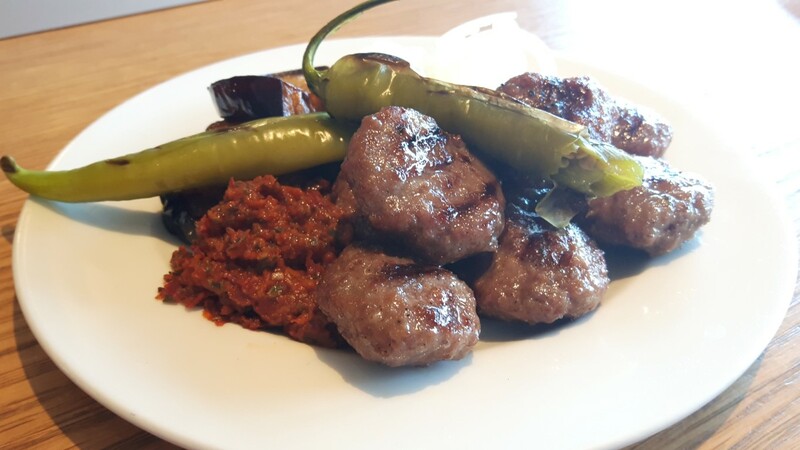 The portion meatball plate is consisting fried aubergine, hot sauce and fresh cutted onion. If it consist blarney as siding portion size is satisfying. Meatballs mainly made of veal and a little lamb meat. The beans of the blarney was well cooked. The spice level with other ingredients are in moderation. There are no open butter milk. They serve Eker brand butter milk. They have take away service. Credit and meal cards are available. They are open every day between 11.00-23.00. Taste: The taste of the meatball is below average. Braising: The master is cooking the small meatballs on the coal fire. Portion Size: Porsiyon amount of the meatball is not satisfying. 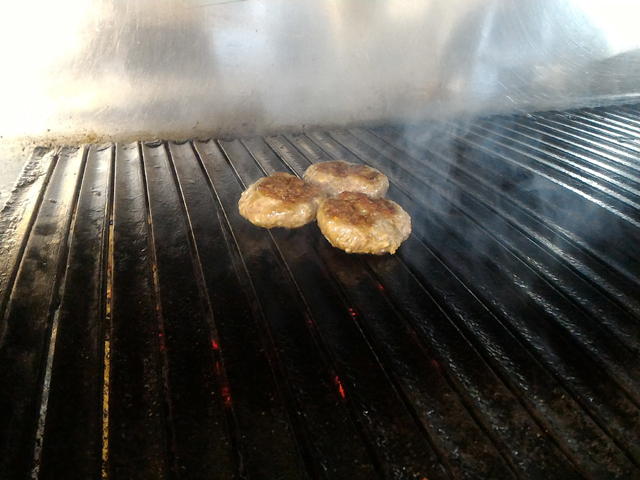 Service: The meatballs are fastly grilling and serving. Price: The price of portion meatball is 15₺, blarney is 4₺, Eker butter milk is 3₺.#KanGurular Ari D.
Taste: Meatball is delicious. It has been grilled moderately. Its juice was remained inside of it. Portion Size: Portion amount of the meatball is satisfying.